Happy Camper (Margot Canfield) and I have had a wonderful time the past two weeks together! Sadly, we’re taking her back up to Monson to retrieve her car today! She’s on her way back to Bmore to get ready for the school year. For those who don’t know Margot, I can say she’s one of the best people to have out here! She is constantly giggling about something! If she slips on a rock, I’ll look back, she’s on the ground LAUGHING! We had an amazing time with “our boys.” Our friends-crew from Monson to Stratton. We lost all 5 of them after Stratton because those man legs carry them so much faster than ours can, but we were also glad to have a couple of days just the two of us. And to our surprise, when we came out to the road crossing last night, Jeff had come across Tag, Effect, and Coach and they were all waiting there to say hi! They had hitched into town that day, and that run-in meant Happy Camper had one last chance to say goodbye. Jeff hooked us all up with Trail Magic: cold juice, gatoraid, sodas and cheeseburgers!!! Thanks Powder! Needless to say, it is one of his 2011 goals to do as much trail magic as he is able. And he even bought a coleman stove to grill on the side of the road for tired hungry hikers! The Cobbs are rubbing off on him! I haven’t actually “solo-ed” yet, so food planning is always for 2 right now. Good thing, because once Powder gets off in 9 days to go to work, I’ll be in the habit of still shopping for 2: which is now my appetite anyway! We always have 4 food bags: 2 for each of us. We eat 4 meals a day, so this works out nicely for organizing the food. 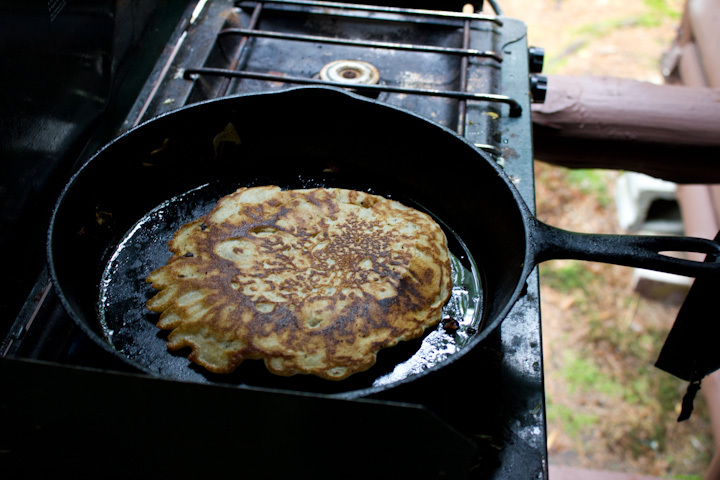 Breakfast: when we’re breaking camp (which by the way, always takes longer than you might think), Snack (usually around 10 or 11), Lunch (anywhere btwn noon and 2pm, depending on when we started in the morning), and Dinner (whenever we finally get to camp). 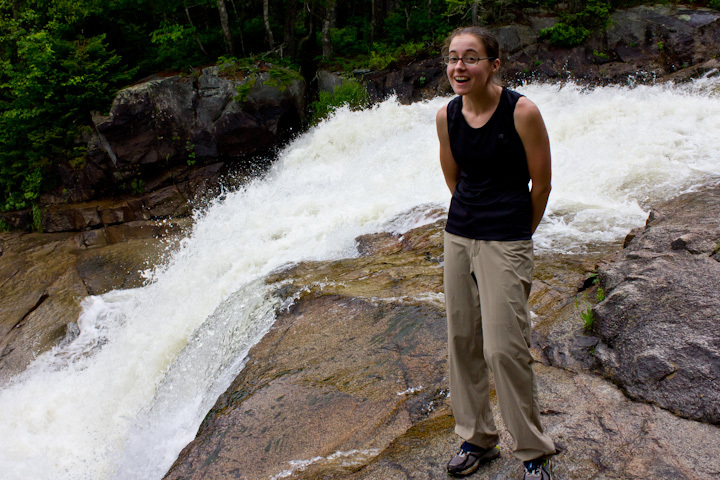 Happy Camper and I were eating lunch with some trail buddies the day we left Monson. All of their eyes got pretty big when they realized what we’re eating. That’s right, we do it in style! Our snack bag alone has typically 10 different kinds of snacks: chips, snickers, dried fruit, jerky, powerbars, spicy crunchy stuff, OCPs (Oatmeal Creme Pies), zingers, etc, etc. A HUGE THANK YOU to Mrs. Sellenrick for the amazing care package in Monson! We brought nearly all of that food with us, and you really got it just right!!! We loved everything so much! Thank you! We barely had to buy groceries for that 6 day stretch! So for lunch we bring bread, mayo, lunch meat (believe it or not, you can carry this un-refridgerated for a couple of days), cheese, baby carrots. I’m still working on creative dinners. The best so far have been Knorr Teriyaki noodles with Coach’s mom’s homemade teriyaki jerky; velveeta mac with tuna, and Mountain House spaghetti with meat sauce. Sounds real appetizing, doesn’t it? I’ll say Snack is the most important meal of the day. I sit down for a good 20 min and just keep eating. The snack food bag is always the heaviest, and the snacks have more calories than anything else: equals energy!!! 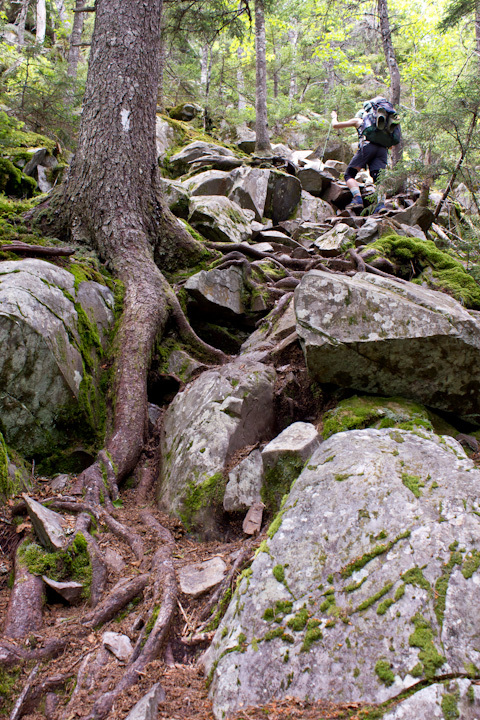 I had Powder take a quite a few pics of the trail covered in roots and rocks. This is normal! Also, it’s normal for the trail to go STRAIGHT UP! 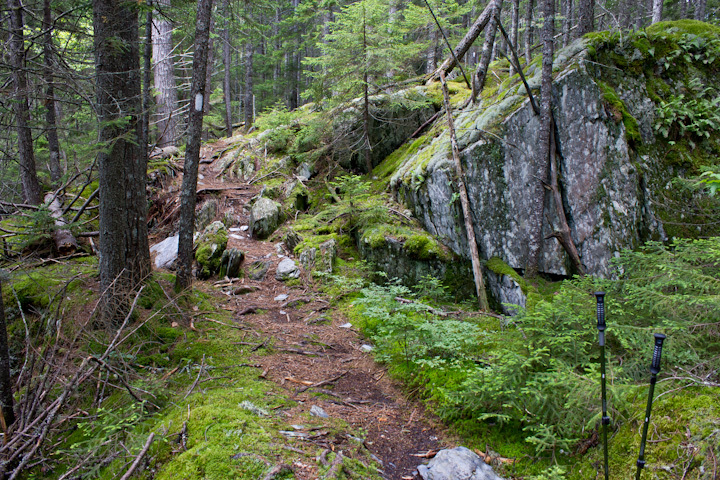 The MATC (Maine Appalachian Trial Club) does an incredible job with trail maintainence. 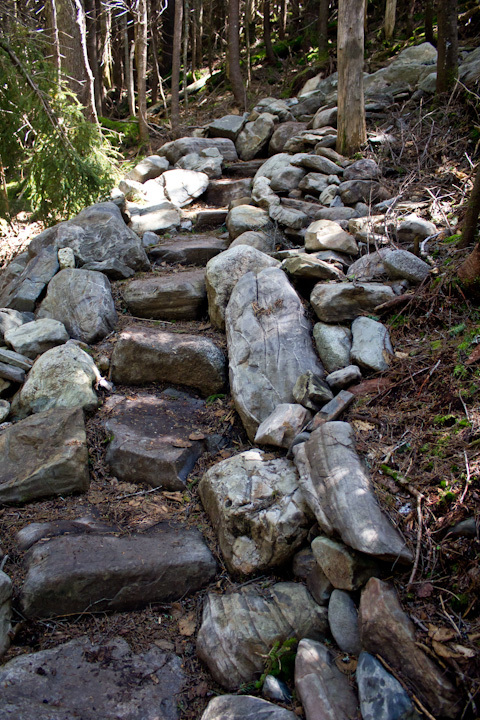 We have passed so many trail crews buildings stone “steps” and digging trenches for rain runoff. 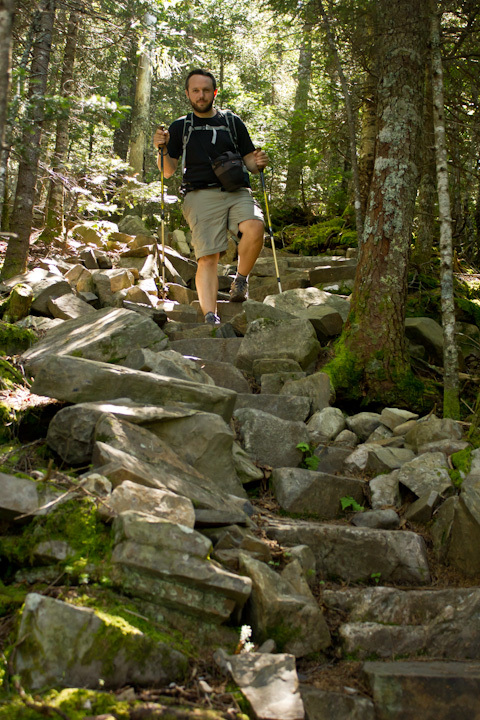 The MATC however does not believe in swicthbacks: zig-zag trail that would lessen how steep your climb is. 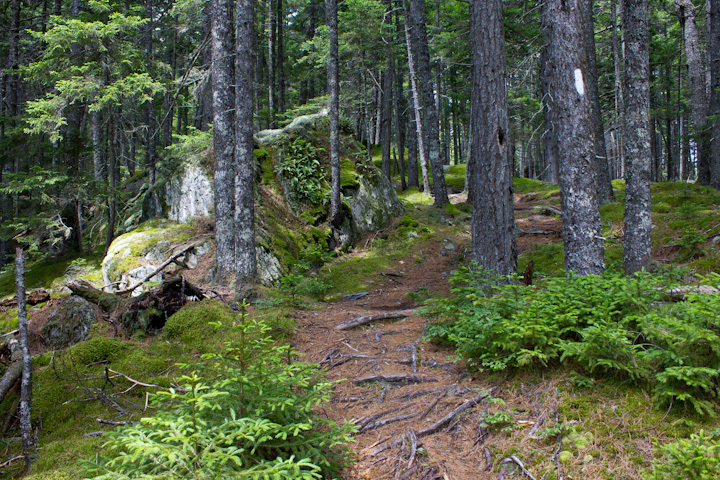 The trail through Maine does zig-zag: East to West. So, we’re doing lots and lots of back and forth miles: never truly going South but always going STRAIGHT UP and DOWN. And that is why this trail is 2,181 miles. 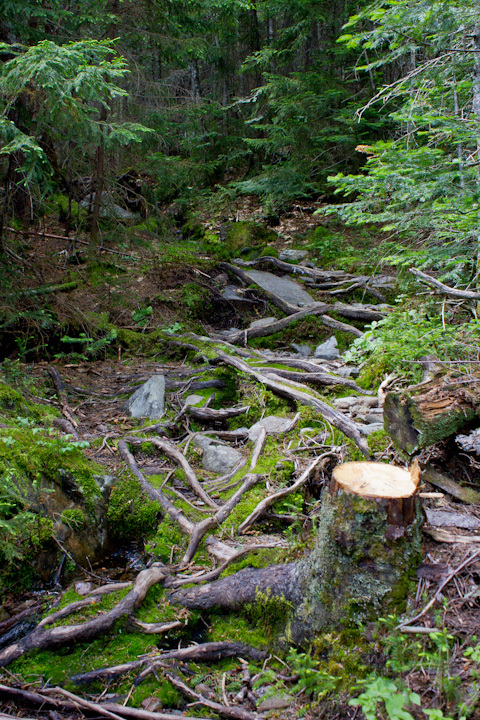 Some of it is because of land ownership: the trail has to cut and skirt around some places. Otherwise, not sure why this trail is so all over the place. 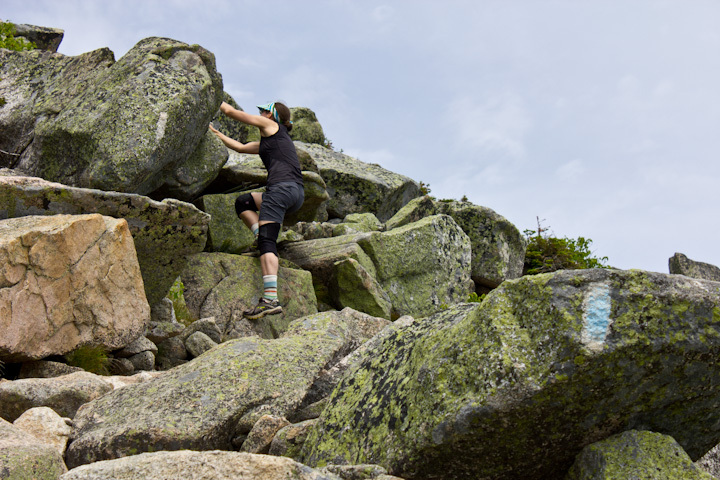 It is as crazy as the people who hike it! 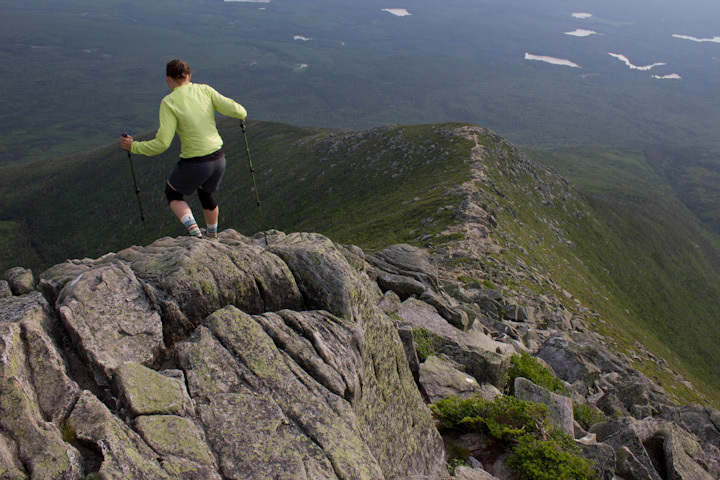 I would not hike this without poles. Never do we step on level ground. You can see from the pictures how crazy the terrain is! Sometimes we are seriously rock climbing. 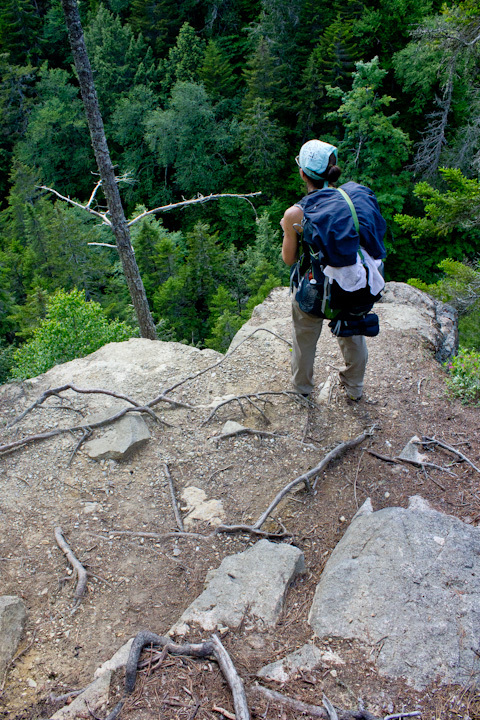 I am a climber, and typically love climbing, but not with a heavy pack on! 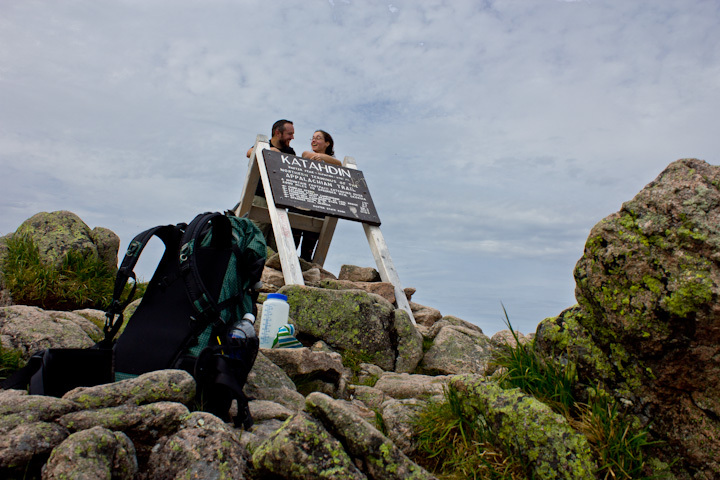 At the end of one long day we were on the top of Bigelow Mountain. 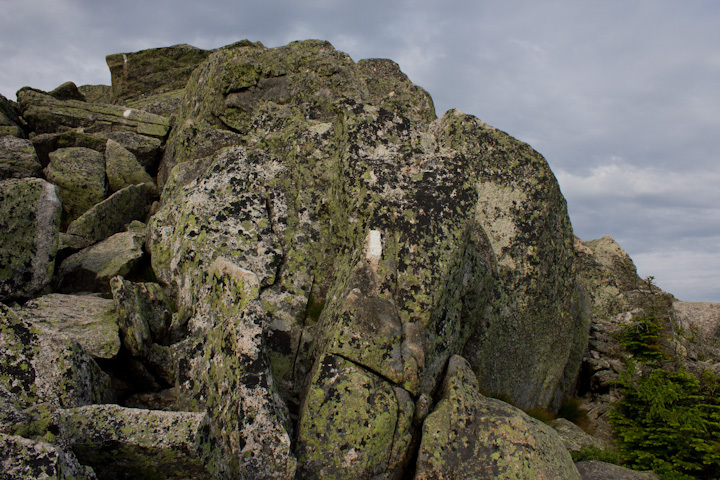 The ridge stretch is all giant boulders. Your poles really do you no good. I must have been headed due West, the sun was right in my face. 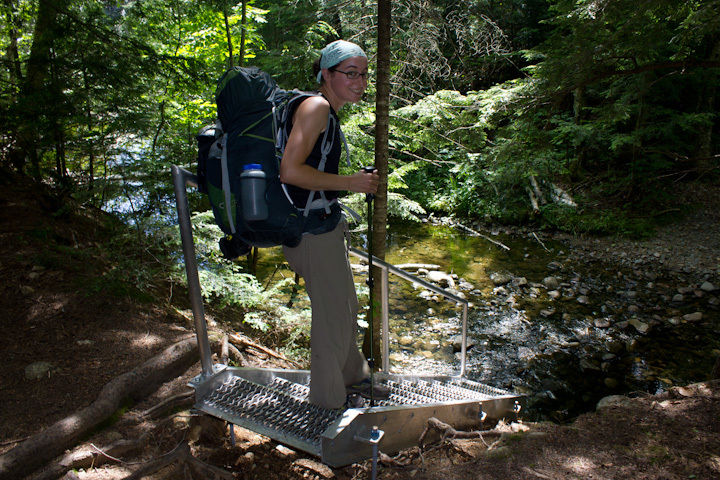 I missed a step and face-planted into the hemlocks that lined the trail! My glasses got knocked off and I was really disoriented. I looked at the tree trunk and at first thought that the branches were holding me up: that I was half way up the tree! But then realized that the ground was right there, and I stepped down. I only tell this story, one: so I can laugh at it now; two: to show you how rugged it is here, and three: to keep my Christian friends praying for my safety! 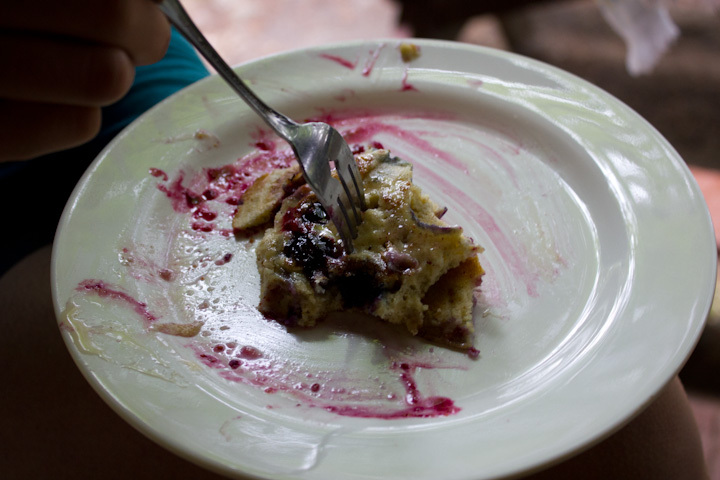 It felt really great to be clean and have clean clothes, and some real food in our stomachs. Oh, and don’t forget the half a pizza in a ziplock! We were ready to tackle the rest of the wilderness. 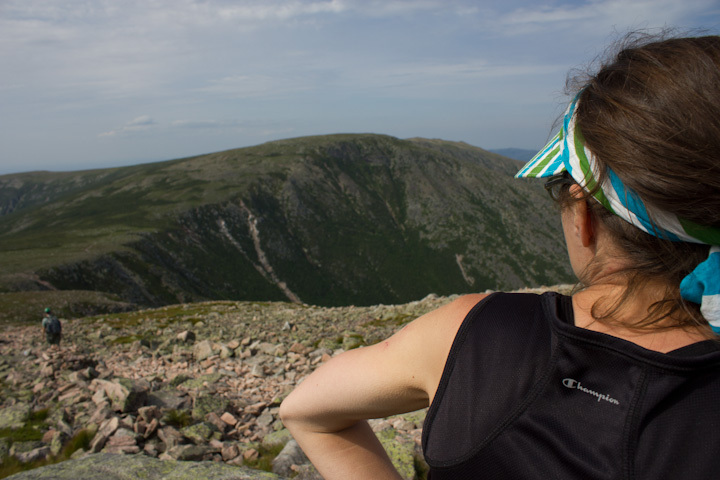 Ahead were several mountains, the first real climbs since Katahdin. 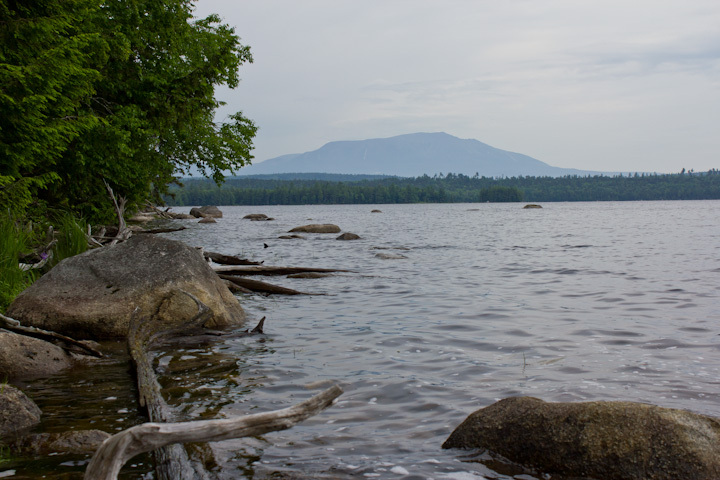 This is quite an amazing view from Pemadumcook Lake of Katahdin, but could be better with some more interesting light. This is the first time we had seen it since climbing it, and it looked as big as ever. I later saw a register entry from a northbounder that said, “____ was right, it looks like Mt. Doom.” (Insert name of some other hiker) That is incredibly accurate. 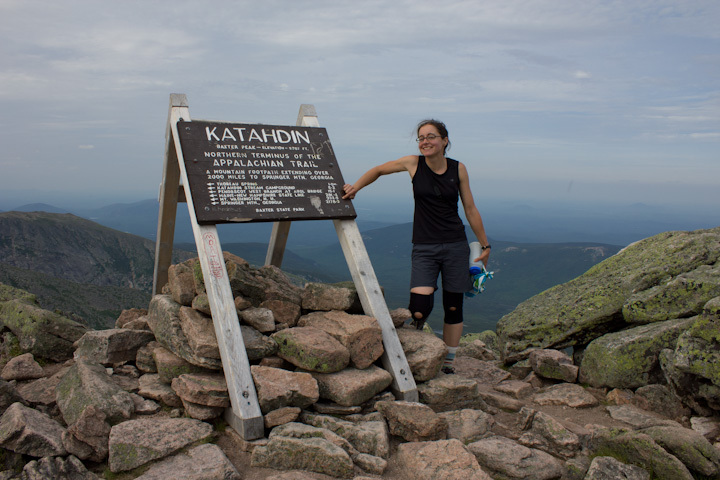 There is something about hiking 2,000 miles to climb one mountain that makes you feel a bit like Frodo. More interesting trail! 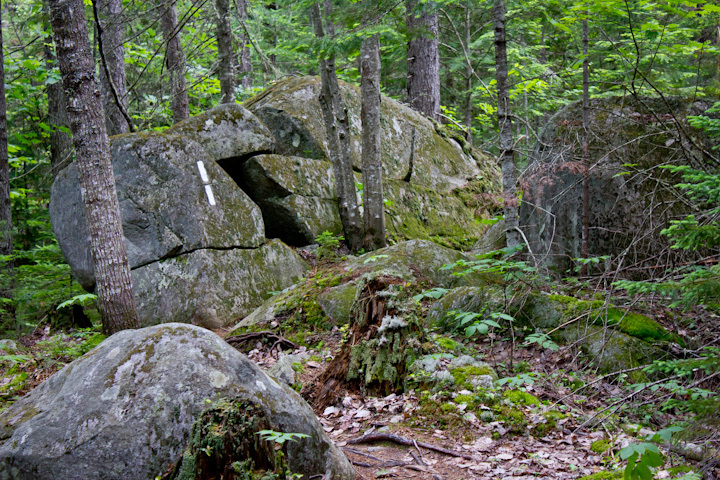 The double white blaze means that the trail is turning either left or right. 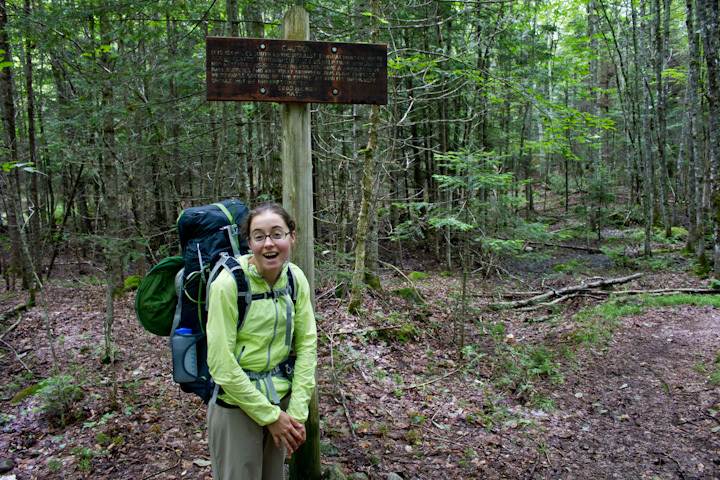 It is really hard to actually get lost on the AT, which is why most hikers don’t carry any maps. 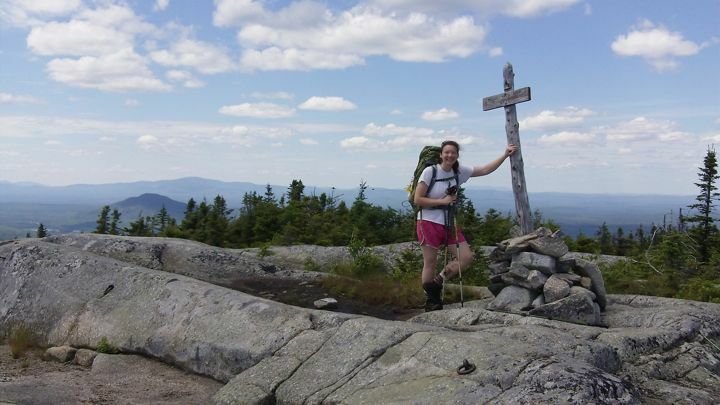 The trail is a linear series of landmarks, and navigation is best done with a data book, which lists each mountain, stream, campsite, lean-to, spring and road along with its mileage and elevation. You soon learn to think of miles in terms of time it takes you to hike them, and with a watch and a data book you can tell pretty accurately what time you will arrive in camp, etc. Marie is carrying this newfangled stove called the caldera cone. The cone shaped pot stand is also a wind screen and an energy trap that focuses the heat onto the pot. 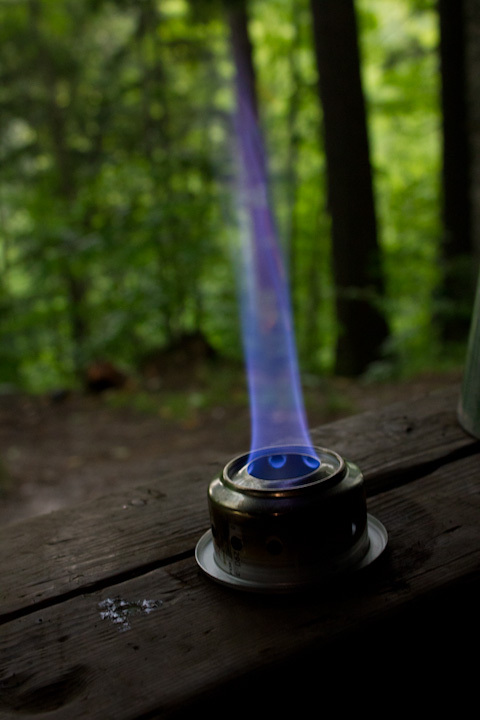 The stove that goes under the pot is a simple alcohol stove made from the bottom of a diet coke can. The little lip around the bottom takes a few dribbles of fuel, and you light the rim which will in turn light the main flame. Total weight for the stove, cone and pot is 7 ounces. Her water purification system is a star wars spacey gadget called a steripen. 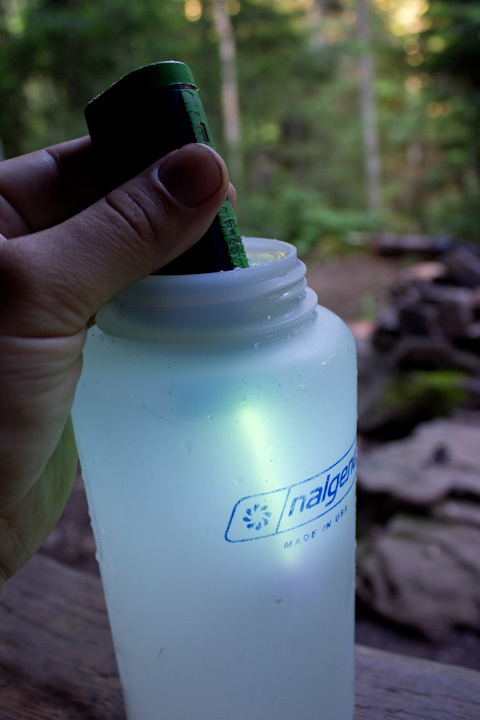 It is a battery powered UV light that is about 2 inches long. You stir the water for 90 seconds with the light activated and it sterilizes all of the baddies in the water. It is affectionately named Obi-Wan. 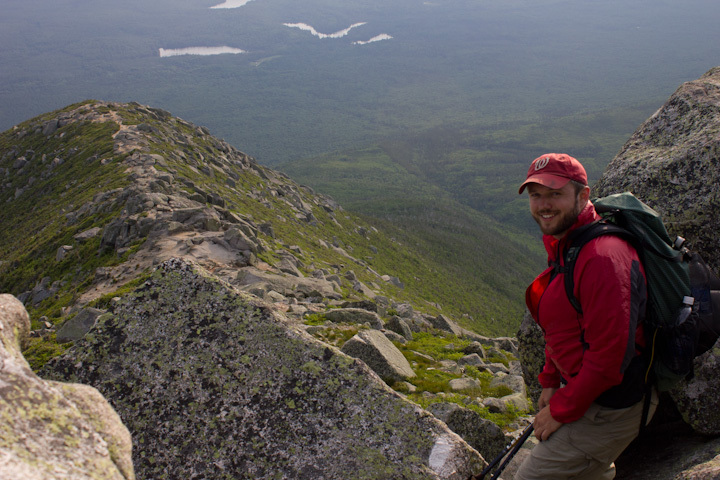 We reached the viewpoint halfway up White Cap Mountain and there was a beautiful view to the north of Katahdin. For being 50 miles by trail away, it was still extremely close. That’s because the trail has zigzagged for those 50 miles. We met a trail maintainer/builder back at Waleigh Lean-to who told us that the trail work on White Cap Mountain took 17 years to complete. It is really mind blowing how many of these stone staircases there were. 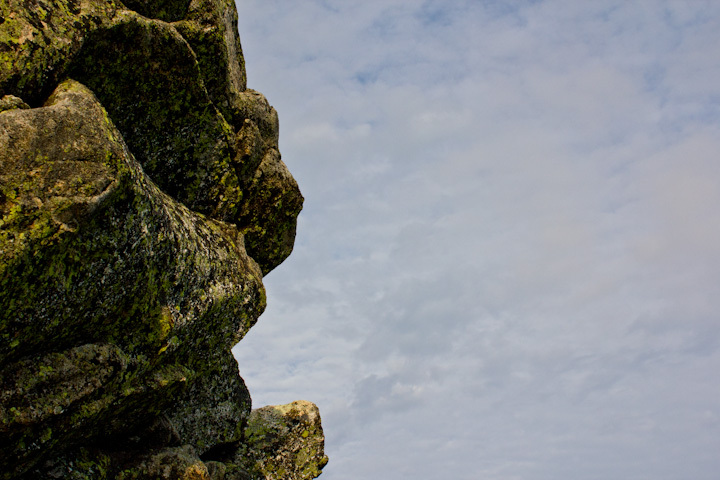 Each giant stone represents an unbelievable amount of work. I understand that they rig pulley systems from the trees and manhandle the stones into place with crowbars. Often there is a stone staircase where there is no evident place where the stones could have come from. The steps aren’t always easy on the knees however. Here is Bobwhite fording another river! 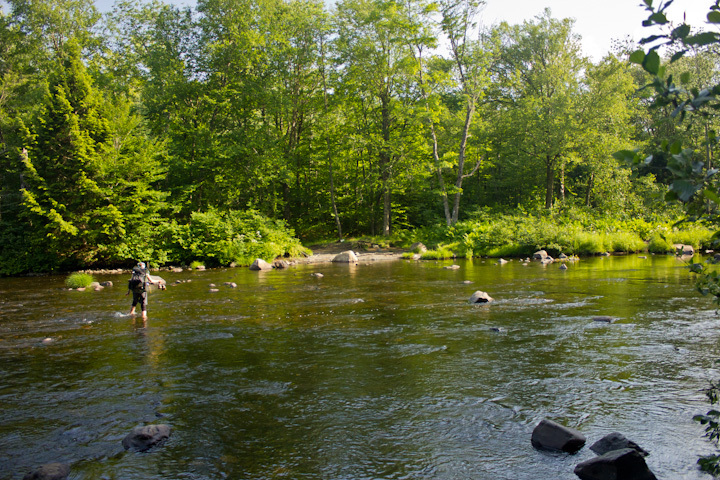 There were at least a half dozen fords in the 100 mile wilderness, and many more in Maine. 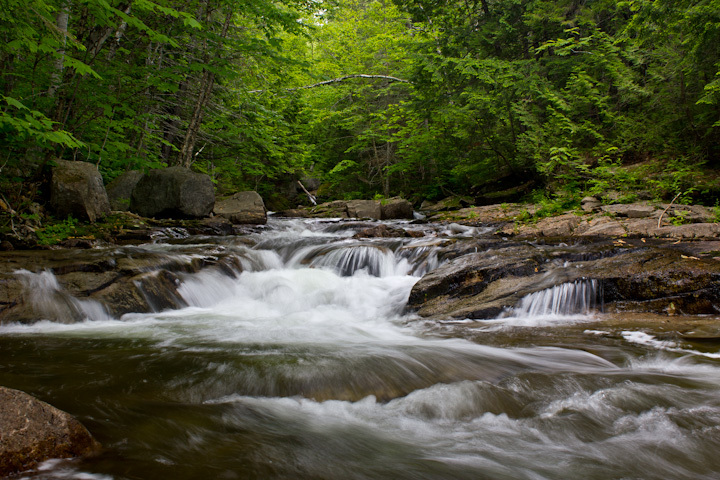 This one is called the west branch of the Pleasant River, and it lived up to its name. It was a gorgeous day and the banks of the river provided a great place to relax. We made a decision to hike on up the next mountain to make it a big 17 mile day. We ran out of gas on the way up, and it became a longer hike than we had bargained for. 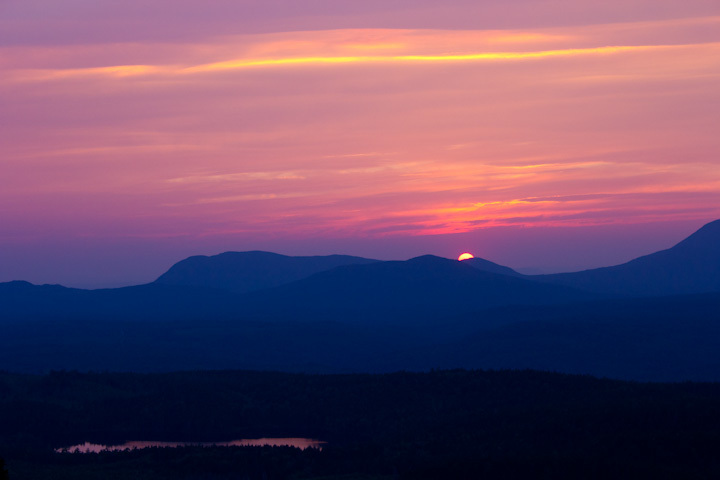 However then we came over the lip of Chairback Mountain and came to this view, just as the sun was slipping below the horizon. It was the highlight of the day. 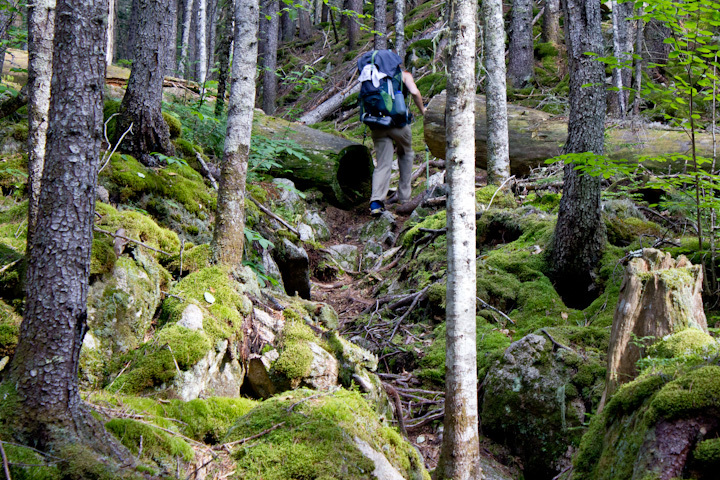 We had been crawling over this kind of stuff for 5 days when Marie said, “Hey I’m not sure people back home really know what this trail looks like.” So this is what it looks like in Maine. 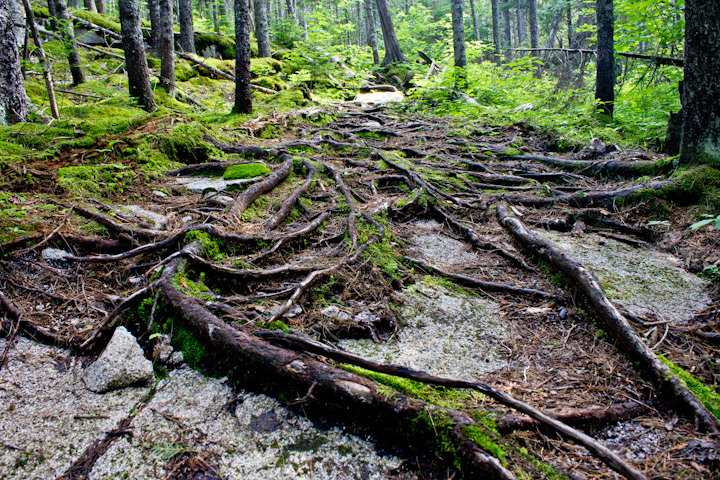 The roots are where you step. 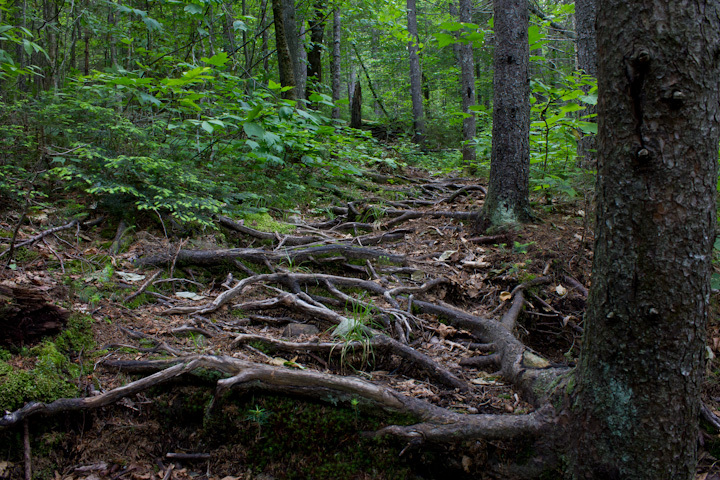 And this is what it looks like when the trail climbs or descends, which is usually. These are just small rocks so they are easy steps! 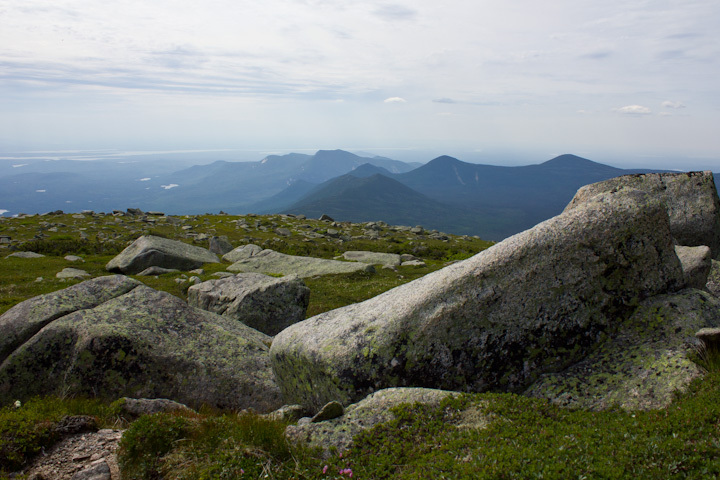 There is a real special place in the col between Fourth Mountain and Barren Mountain. In the data book it just says “bog.” But it doesn’t mention that this is a real, bonafide bog, not just a swampy waterlogged bit of trail. 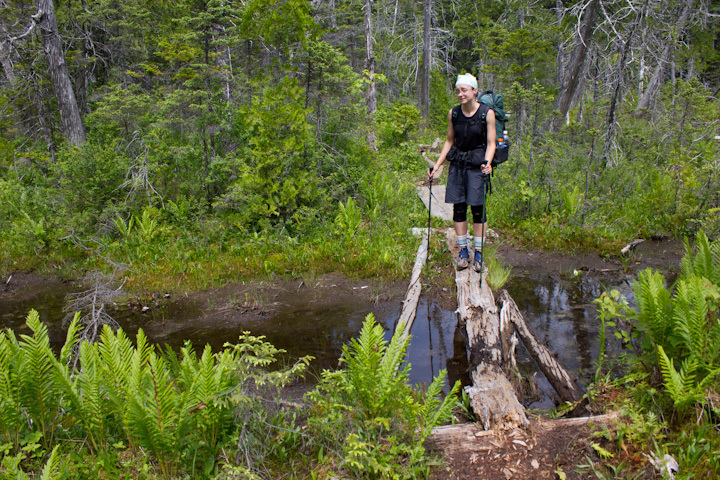 There are some unusual plants here, and you definitely don’t want to slip off of the bog bridges! 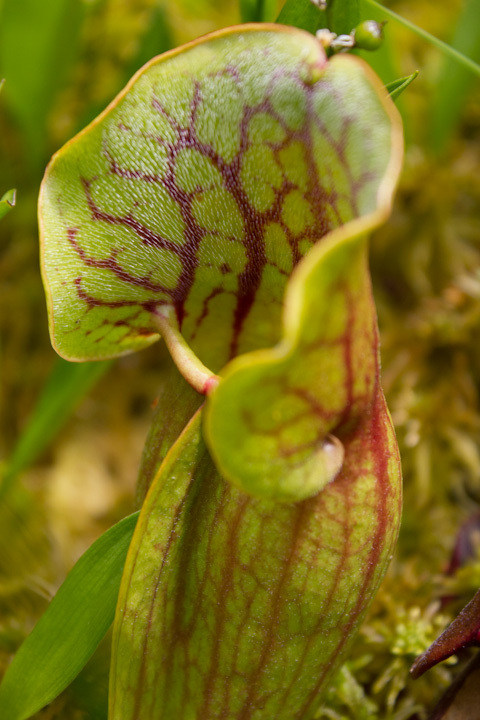 Pitcher plants! 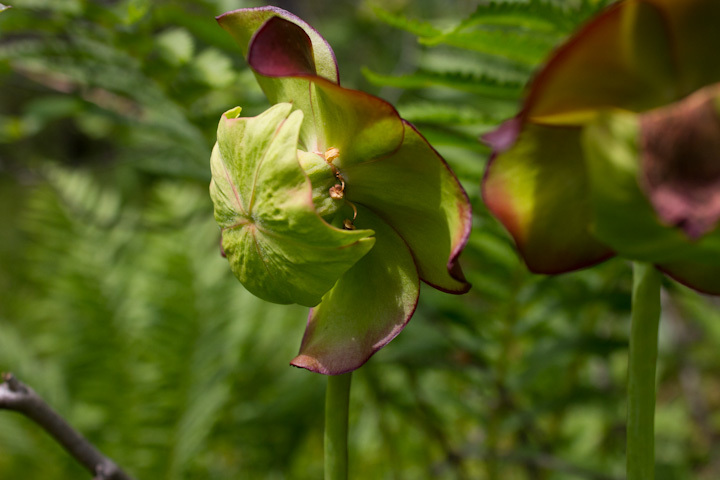 This is the only place on the AT you can find these- it is a carnivorous plant that entraps insects inside with a nectar substance, then devours them for nutrients. The bog also had these strange flowers. Pretty crazy stuff. It was getting dark out yet it was only around 6 pm. 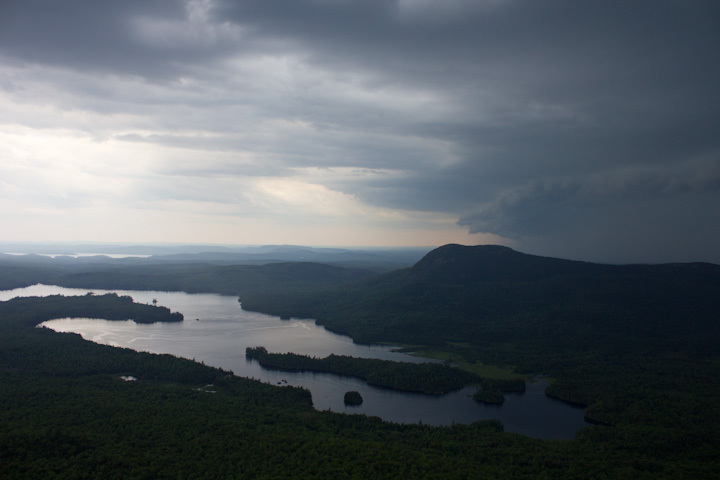 There was a massive thunderstorm rolling in, just as we hit this overlook over Barren Mountain. We could already see lighting, and the thunder and lighting were 12 seconds apart. The storm was soon upon us, as we made our way down the mountain. The thunder and lightning went down to 3 seconds apart, and we even saw a bolt strike the mountain across from us. It was very exhilarating! The next morning we came across this feller who seemed to be performing some transformation. The looping black things were stuck into the log, and he was using them to leverage some sort of molting process. We stood there for about 10 minutes whatching it and taking pictures. It was like watching the Discovery Channel! I guess he’s giving birth to some new wings? This was our last day in the wilderness, and it included some of the most unbelievably beautiful forest you will ever see. This was the view up the Little Wilson stream. The rock walls were made of slate, and cut lots of right angles. There is a 60 foot waterfall not far up there. A slate waterfall! Check out all the right angles- it looks like it was man made by some ancient civilization. There really aren’t words to describe how beautiful this was. 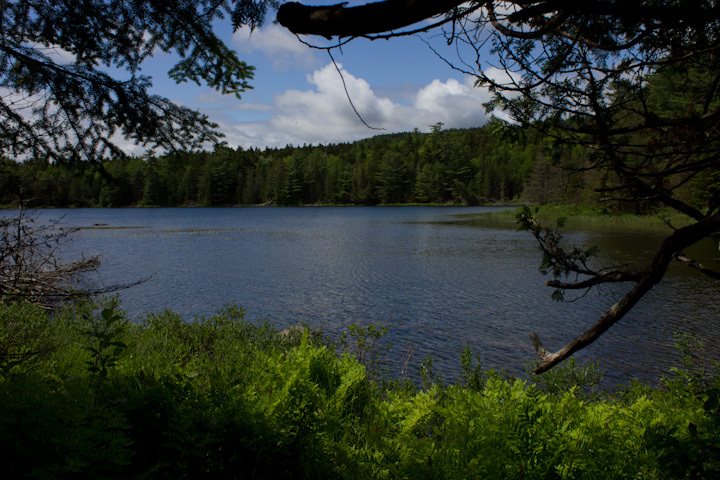 There were several of these ponds in the last couple of miles before the highway, and they were somehow different and more beautiful than all the lakes we had passed before. 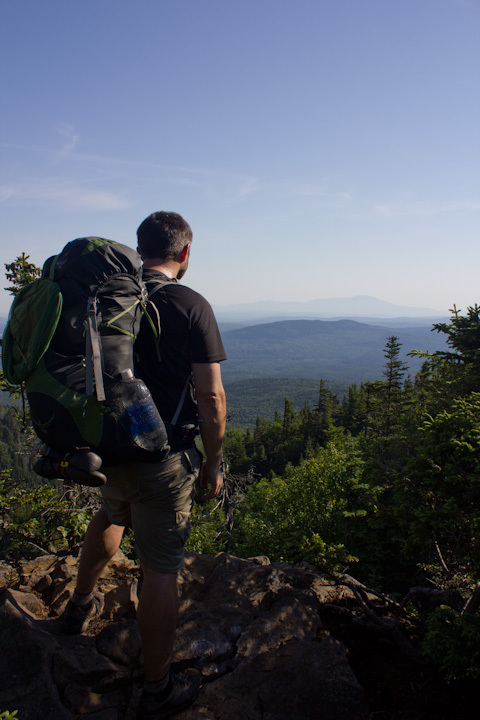 We were ready to go into town and could hear the trucks on the highway, but we were really taken aback by the beauty of the 100-mile wilderness one last time. We did it! As we came out to the road Marie did the Bobwhite whistle, which Margot heard from her car where she was waiting for us! 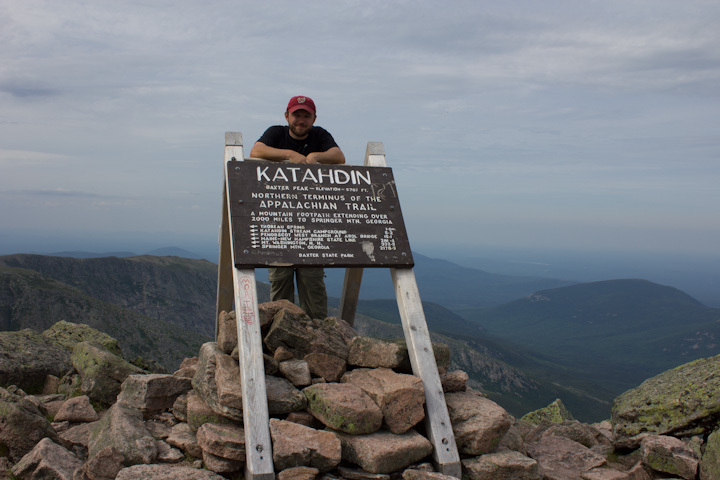 The sign is wrong- it should say 114.5 miles to Katahdin. I just noticed the smiley face on the pole. 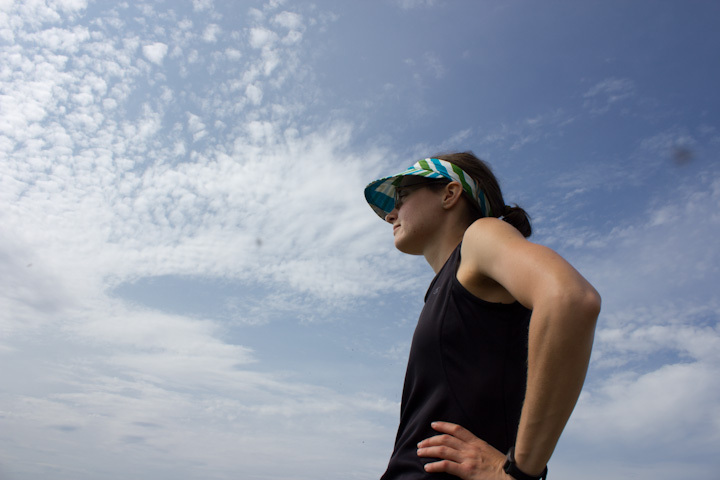 We have traveled an incredible distance, and Marie is feeling great. She doesn’t have a single blister! She is definitely going to enjoy this lifestyle for the next six months. The next day we took a much-deserved zero day which included a trip to the stunning town of Greenville. 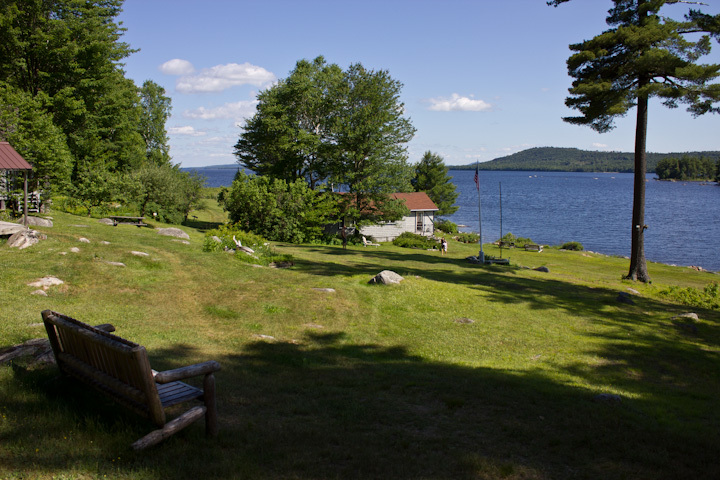 This town sits at the south end of Moosehead Lake, the largest lake in New England, which runs 40 miles to the north. 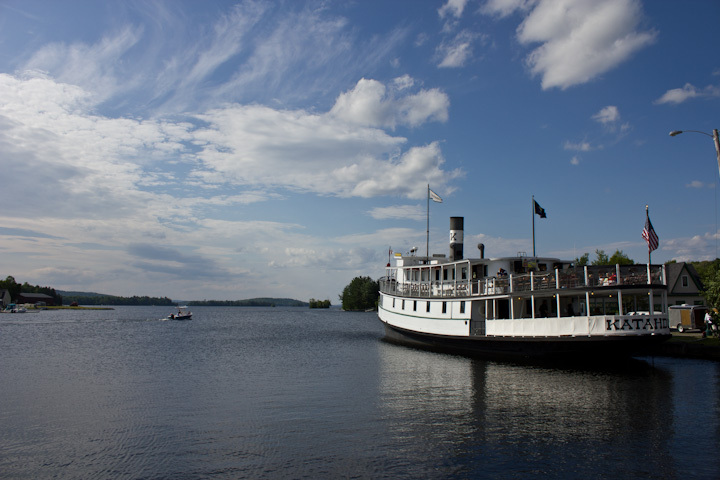 The name of the steam ship is Katahdin! 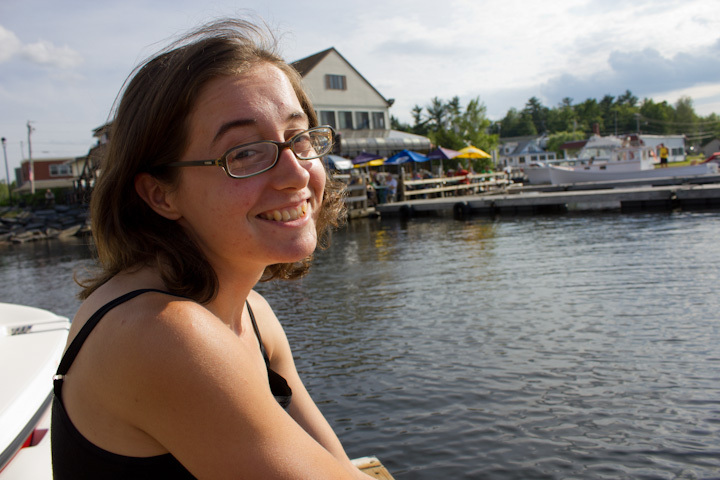 This is the smile Marie gets when she is around boats and water. 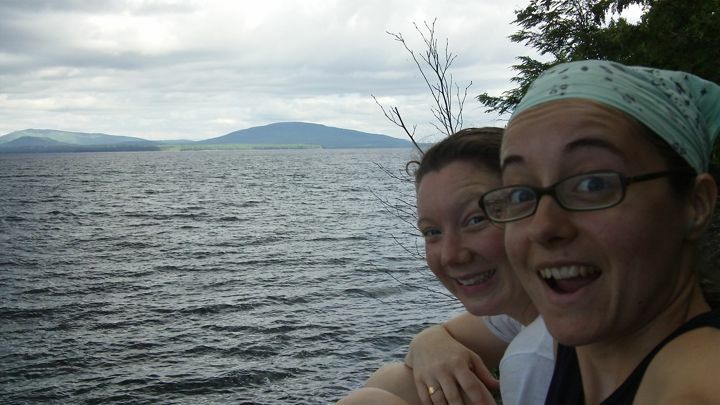 Too bad these Mainers only had a single sailboat within view! Margot bought a harmonica! It was so great to see Margot, and I’m very excited that she’s joining Marie for the following two weeks. They’re going to have a lot of fun. What more perfect ending to this trip could we have asked for than for some down home bluegrass inside the Monson General Store? 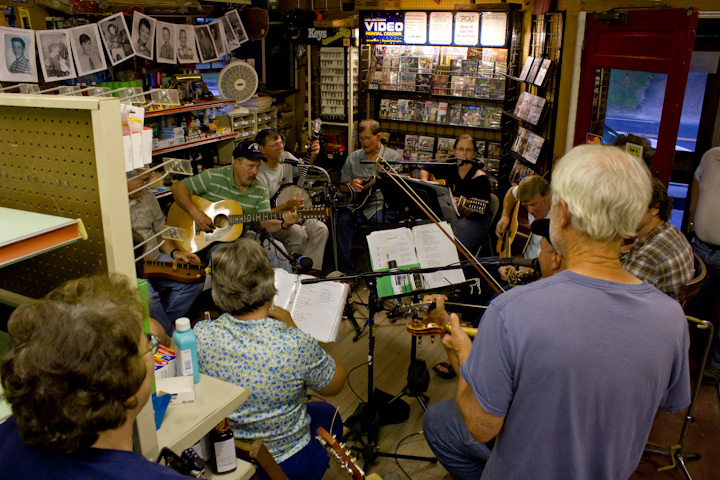 Tim is the guy on the guitar and green shirt and he owns the store, and has been putting together these jams every friday night for many years. 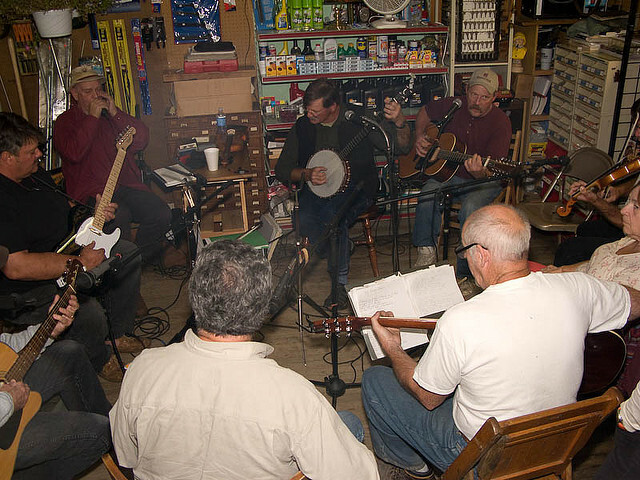 Some of the musicians travel as far as from 40 miles away, and it is a real fixture in the community. The entire store is jammed with people, mostly folks 70 and over, plus the hikers. It was really bittersweet! 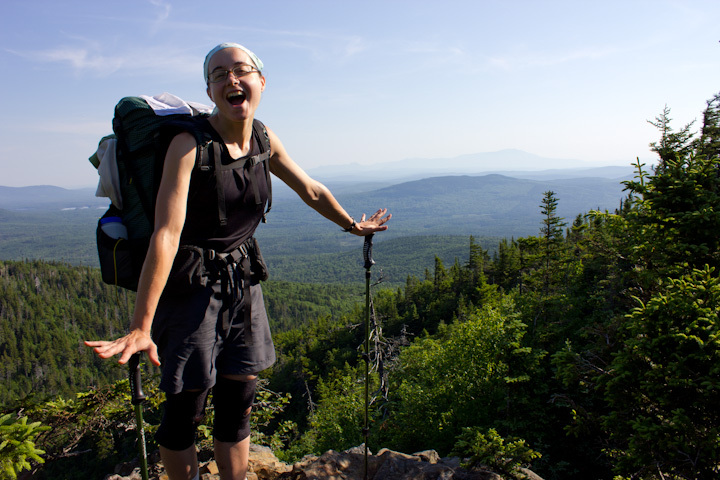 This photo was taken in September of 2008, also on a Friday, when I was nearly done with my northbound thru-hike, and headed into the 100-mile wilderness the next morning on my way to Katahdin. It was an incredible memory. There were about 20 of us hikers packed in there with all the locals, and I’ll never forget singing along to “Country Roads” at the top of our lungs! It’s good to see that not a thing has changed here in Monson, and I’m so glad I could share this moment with Marie. What would a bluegrass show be without a little dancing? 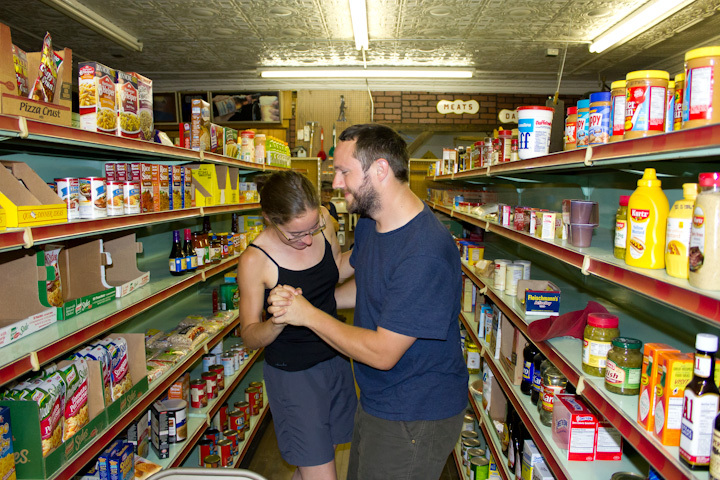 As we left one of the locals said to me, “I saw you two dancing!” as she gave me a wink. 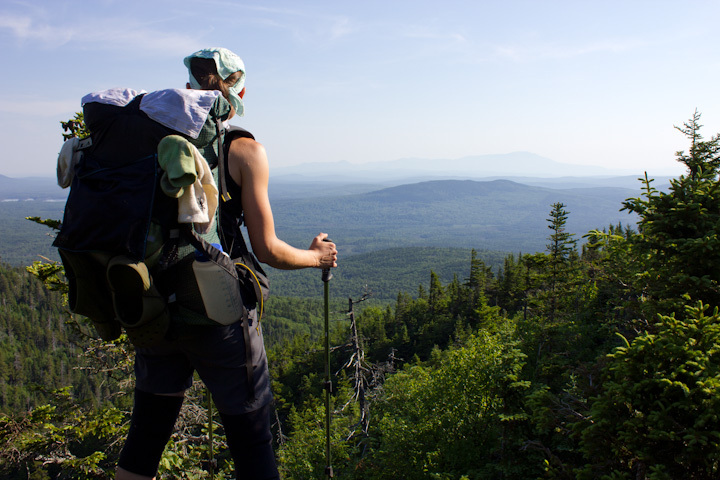 If there is one part of the Appalachian Trail in Maine people have heard of, it is the 100-mile wilderness. 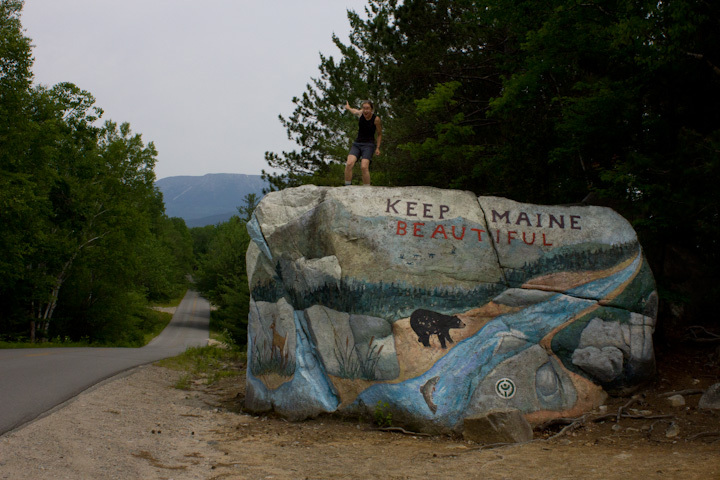 The name is pretty awesome; it evokes everything people want to believe about the Great North Woods of Maine. 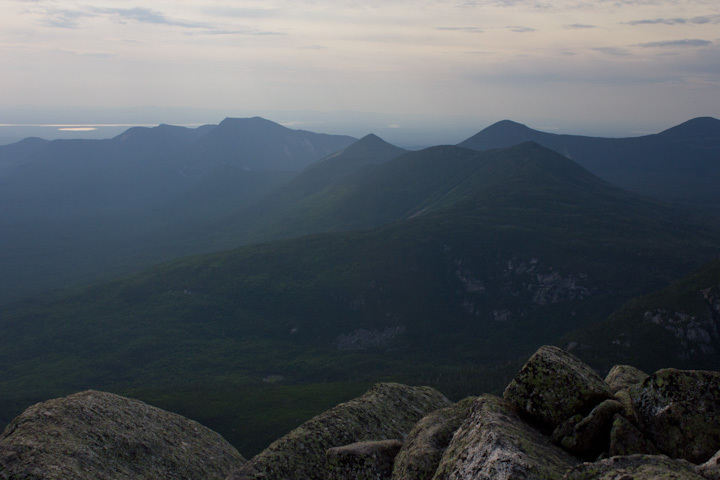 The idea that there is a wilderness of such a length in the northeast intrigues and captures the imagination, and the trail itself really does live up the the name. 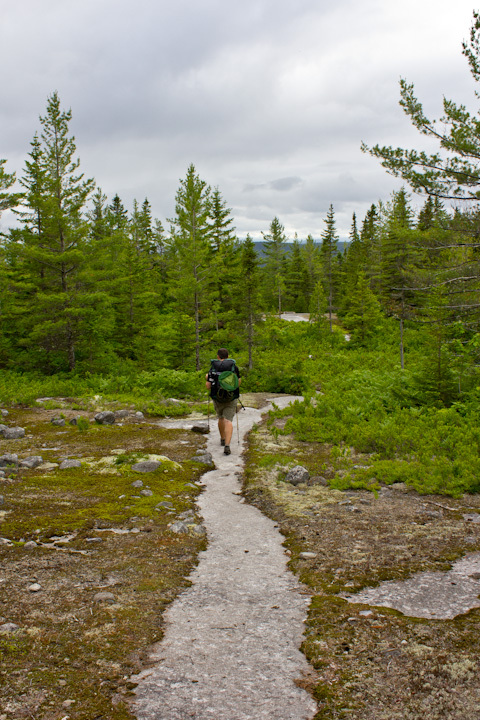 However it isn’t an actual wilderness area, (as designated by the federal government) and roads and civilization are not far off the trail at many points. 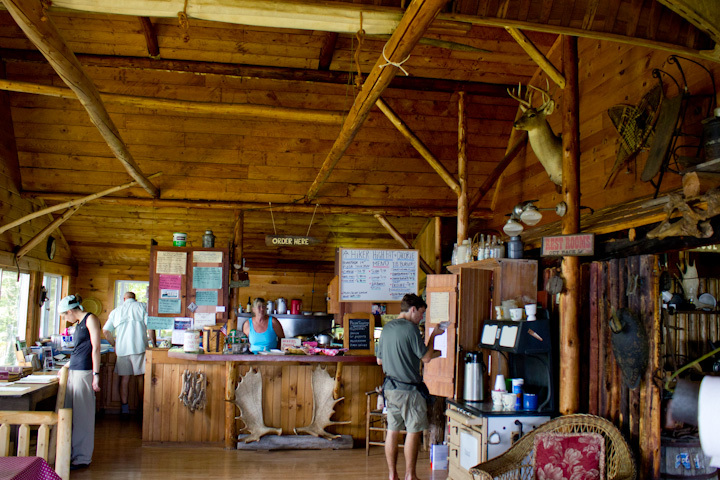 This includes a hostel called White House Landing in the form of an old logging base that has been beautifully converted into an oasis retreat for hikers, complete with supplies and 1lb cheeseburgers. It is exactly what the wilderness needed. 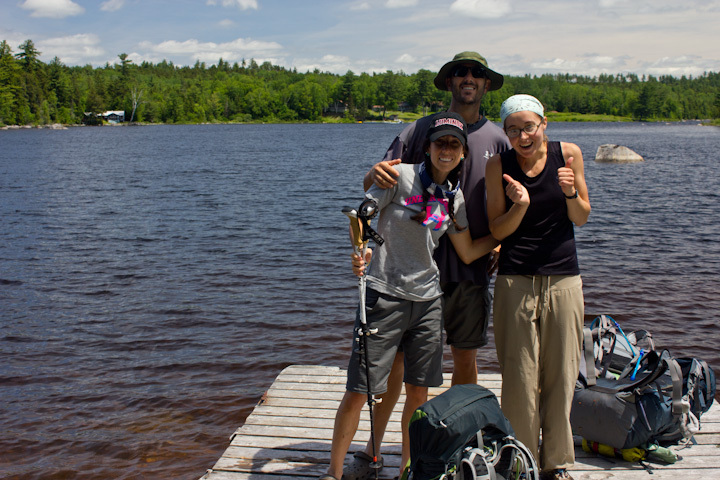 So we kind of did two wildernesses, one 30 miles and the other 70. It was much better that way. But first lets back up. 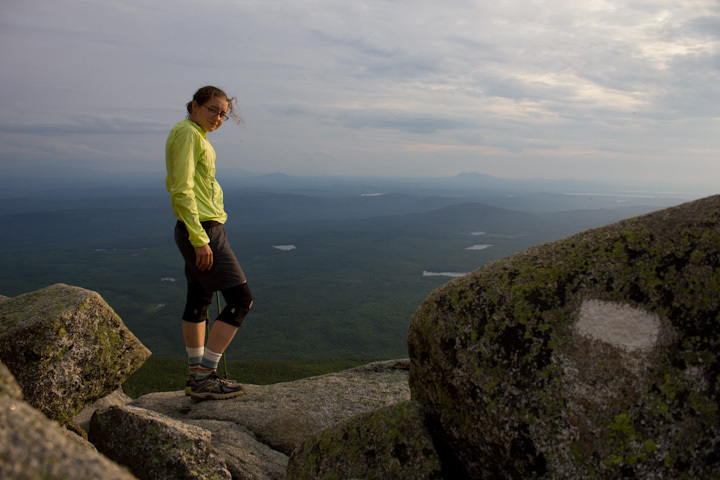 The morning after our monster Katahdin hike dawned rainy and overcast. Just the kind of weather you don’t want on the summit day. This was the day we had planned to summit on originally. We were tired but we had a pretty easy day. 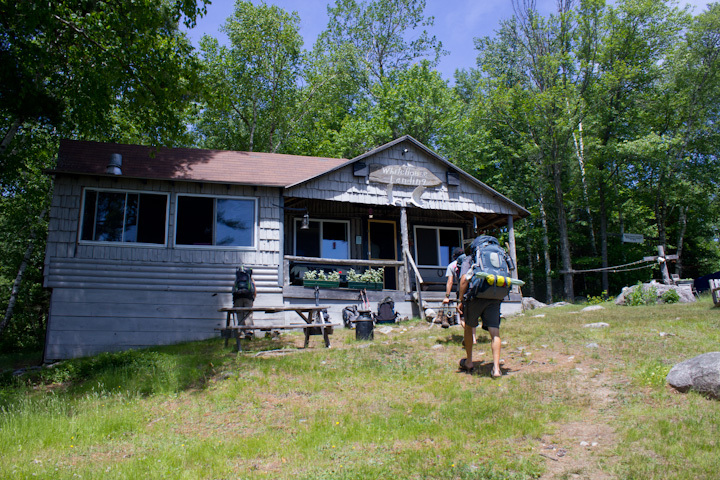 Marie’s parents had rented a cabin on Daicey Pond in Baxter Park, and we planned a day hike of around 7 miles to get to the beginning of the 100 mile wilderness. There was much sleeping in and eating this day. 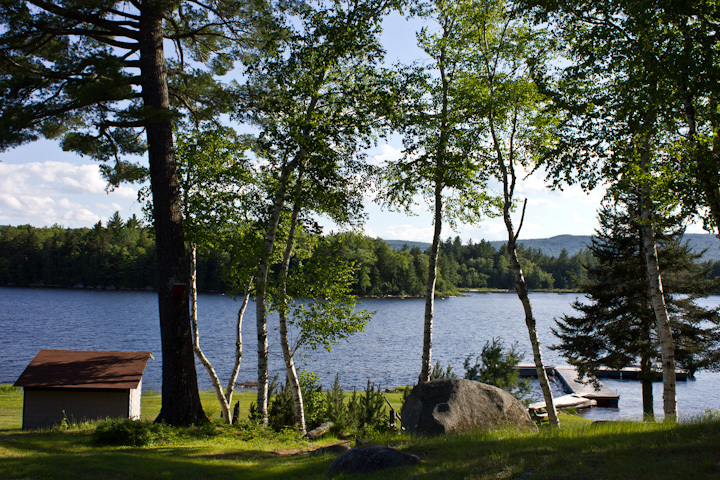 Marie’s parents are professional campers and employ the most incredible cooking as the centerpiece of the camping experience. The call it “glamping,” or glamorous camping. I have to say I was sold immediately. 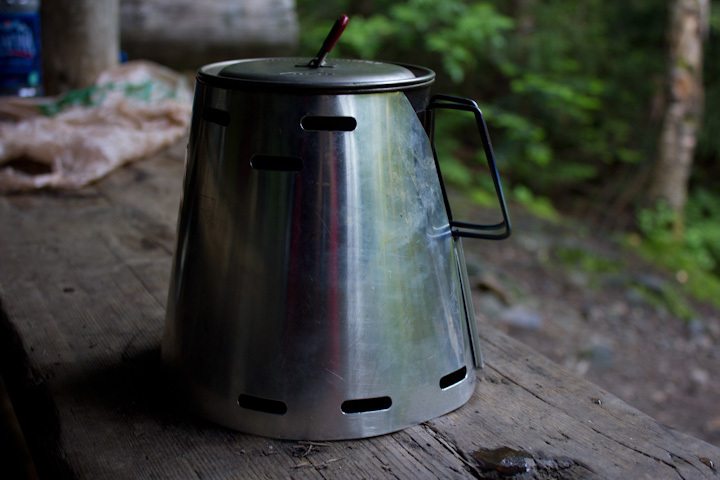 It made my oatmeal packets and pocket rocket stove seem downright silly. Later in the evening we had some of the best spaghetti I have ever had. Finally after lunch we got started on that days hike, which was short, flat, on good trails and without packs. 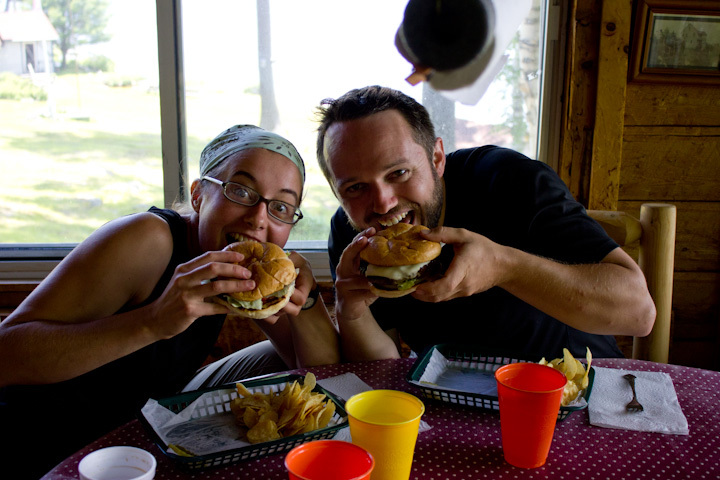 We were being picked up at the end of the day to spend one more night in the cabin with unbelievable food. Hurray for roads and long, circuitous trails convenient to pickup at the end of the day! 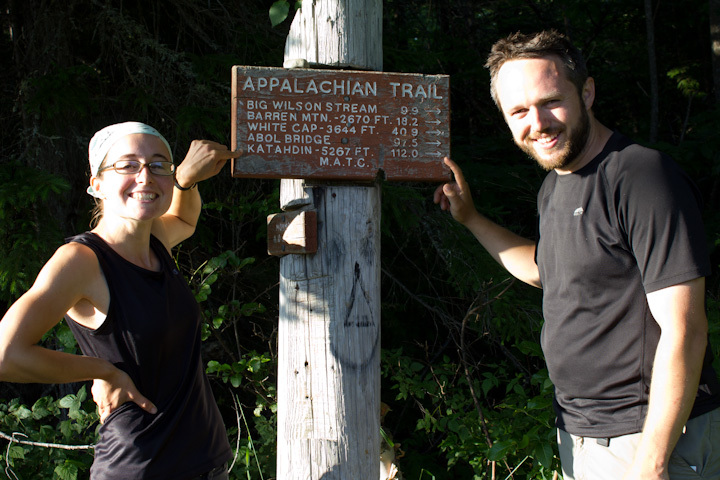 We would start fresh at the 100 mile wilderness the next day. 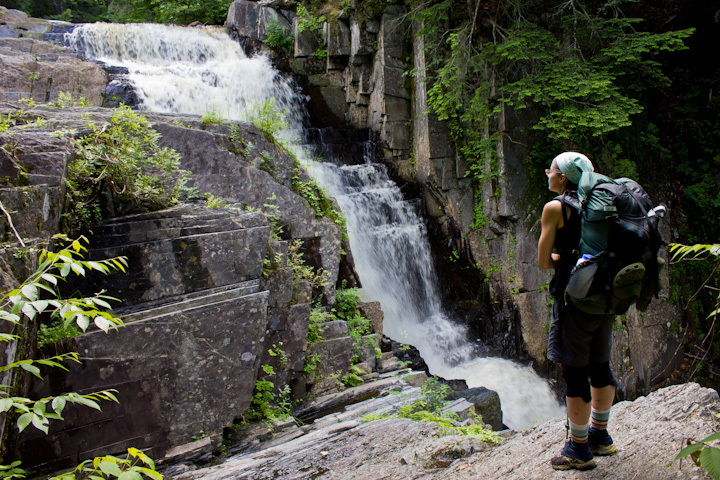 These are the “Big Niagra Falls” in Baxter State Park. 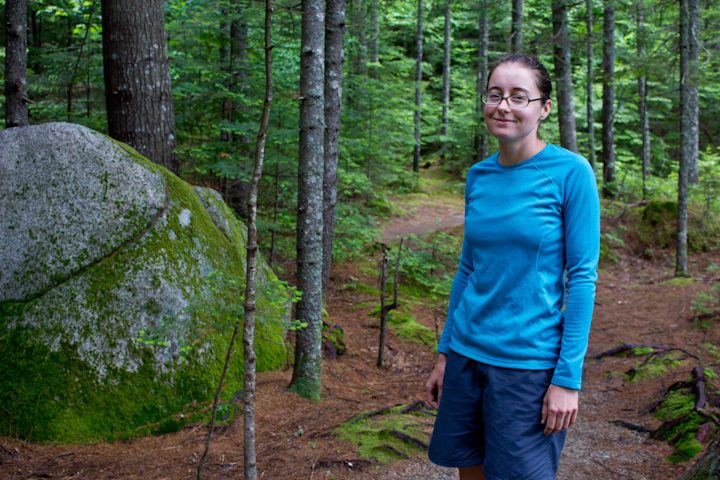 The hike was beautiful except the mosquitoes were absolutely miserable! We didn’t have any bug spray so we wore long sleeve jackets for most of it and literally ran through some parts. They were as bad as I’ve ever seen them. One of my first memories in life is when I was 3 years old we went to Alaska, and I remember my brother Shane running from the woods with his pants down as the mosquitoes started swarming him when he was trying to pee. Had they been like this I would do the same! We saw a moose in Baxter! It was our only one we saw for the first 115 miles, and it was a female. 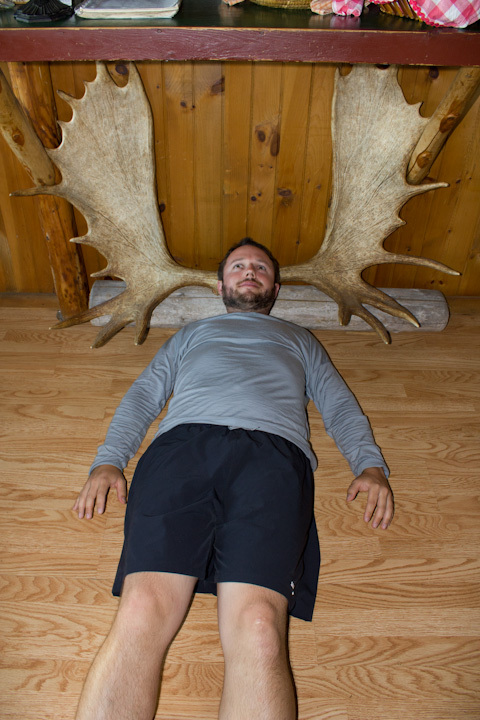 It was Marie’s first moose! There is no picture as we spooked it into the trees. The Cobb clan! They had brought these “nerd hats” as they are called and we decided it would be a good idea to take them with us. Turns out, we didn’t need them past Baxter Park. 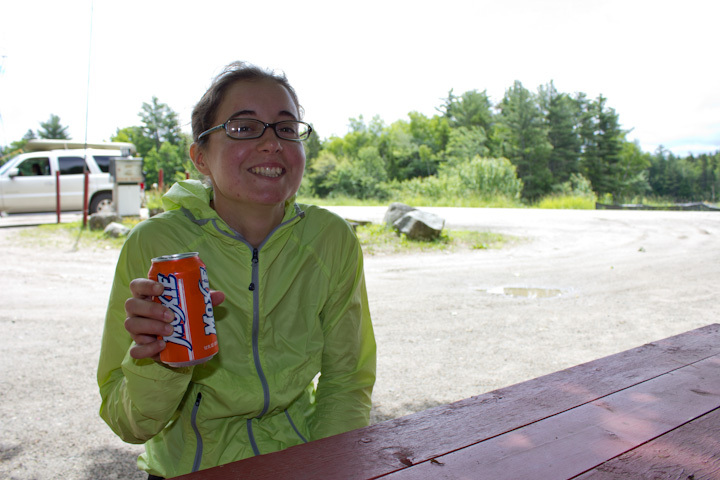 Marie’s first Moxie! This is at the Abol Bridge store, the last bit of civilization before the “100-mile” wilderness. Well, that’s what they say anyways. 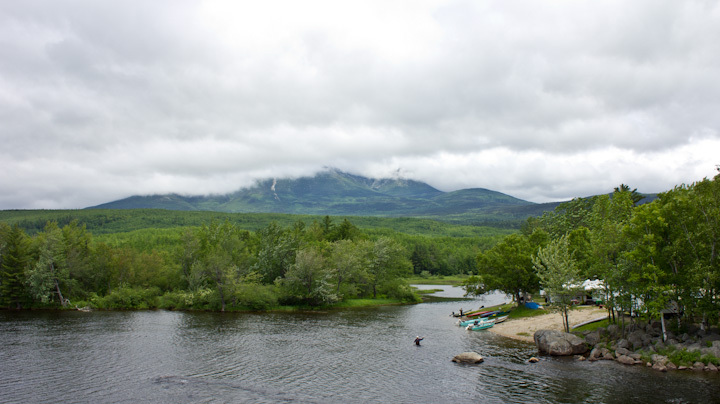 The view of Katahdin from Abol Bridge (Over the Penobscot River) is quite beautiful on a clear day. Here it is nothing but clouds and a guy fly fishing. I will say I like this view too. 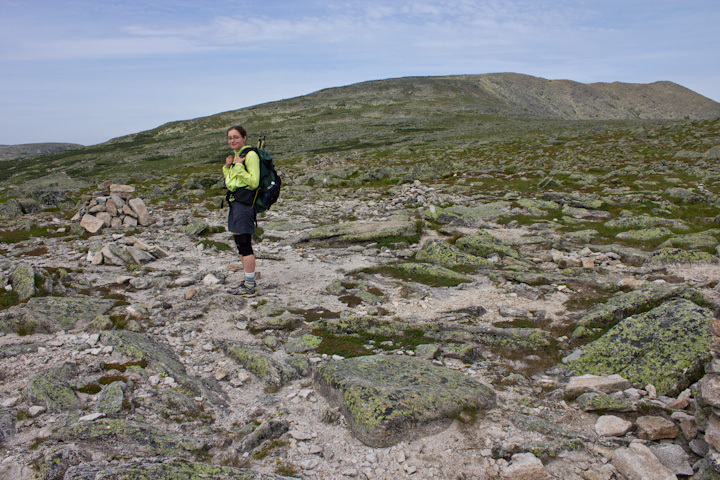 So glad we summitted the day before in the beautiful weather! The ominous sign reads: “CAUTION. It is 100 miles south to the nearest town at Monson. There are NO places to obtain supplies or help until Monson. 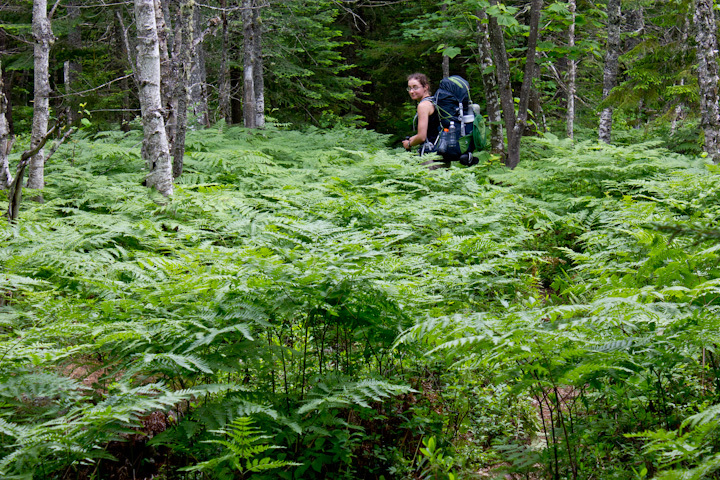 Do not attempt this section unless you have a minimum of 10 days supplies and are fully equipped. 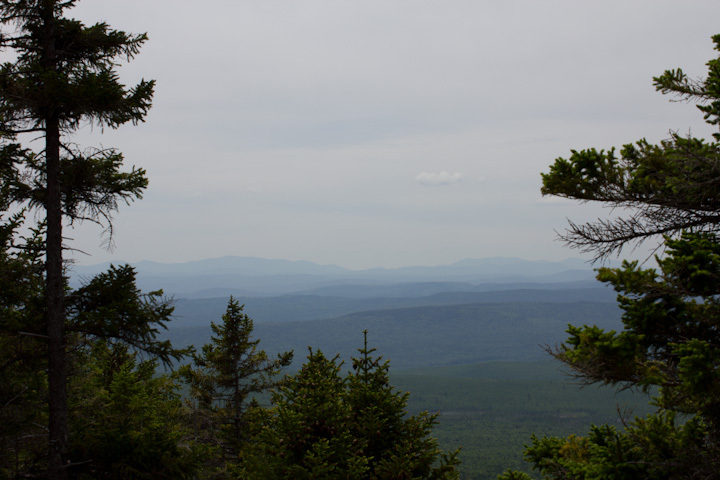 This is the longest wilderness section of the entire AT and its difficulty should not be underestimated. Good Hiking. M.A.T.C.” Thru hikers generally laugh at this sign, especially northbounders who by this point are really cruising and routinely enter the wilderness with 4 days of food. We were carrying 7 days of food. 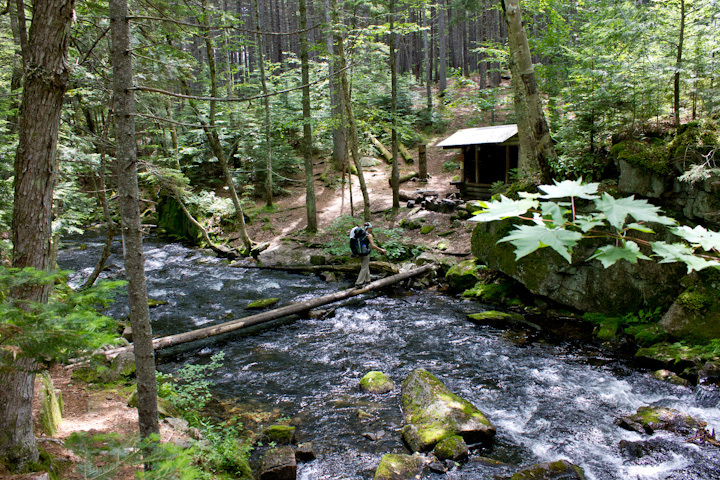 This is typical Maine wilderness. 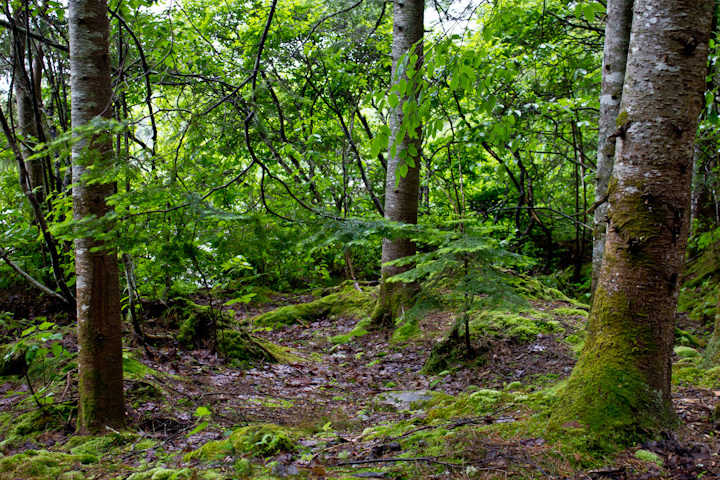 It is rocky, rooty, mossy, piney, muddy and buggy. And oh so beautiful! 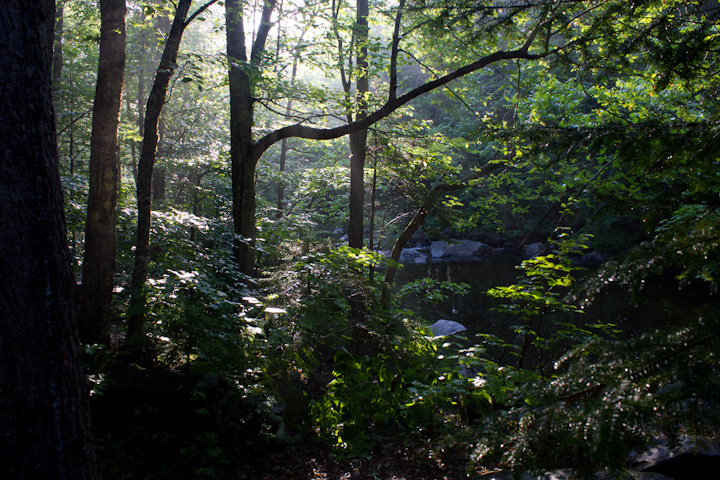 No where else in the Appalachians can you find this kind of forest, and for a girl from Virginia it was a new experience. Roots. 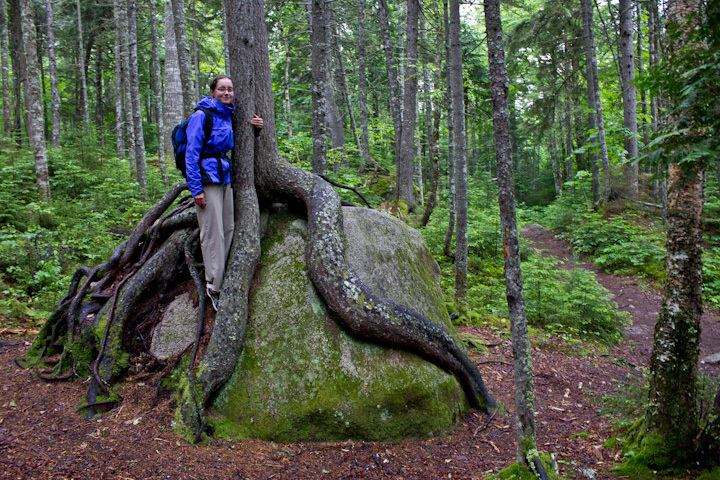 Trees in Maine seem to do just fine with their roots very close to the surface. Sometimes they sprawl over rock, and have tough bark to match the tree. 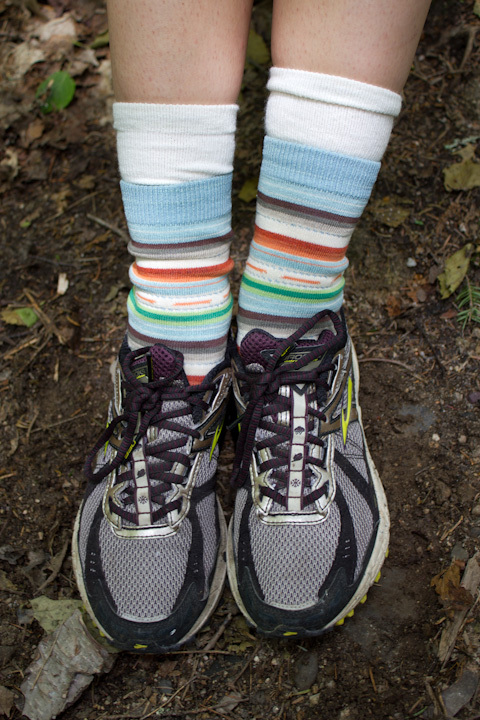 They are always underfoot on the trail, and make for difficult walking. The good news for the trail crews is they do a great job at containing erosion. 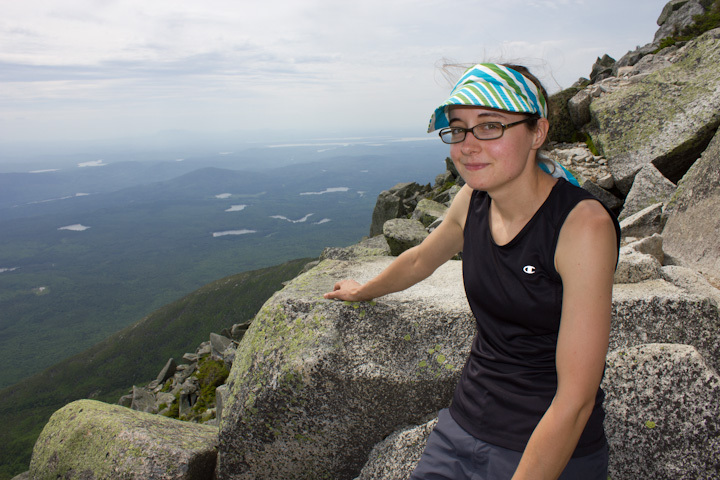 This is called Rainbow Ledges; a high granite area where the rock is just under the surface. 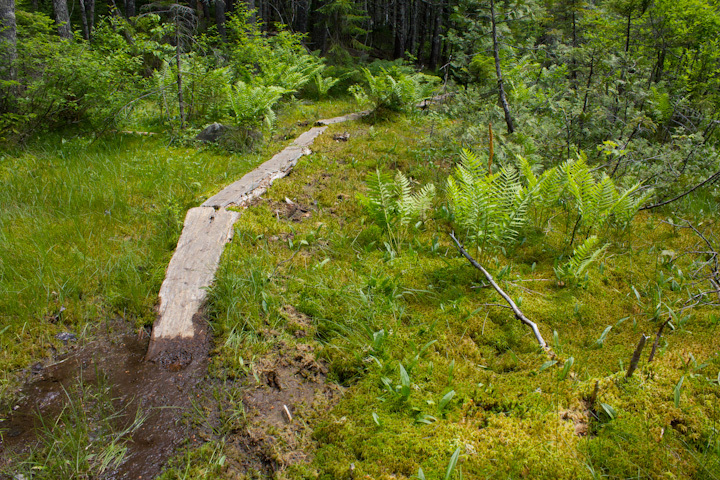 To create a trail here they just cut a 2 foot wide path through the moss and alpine plants on the surface. It looks like a sidewalk. Waist high ferns! 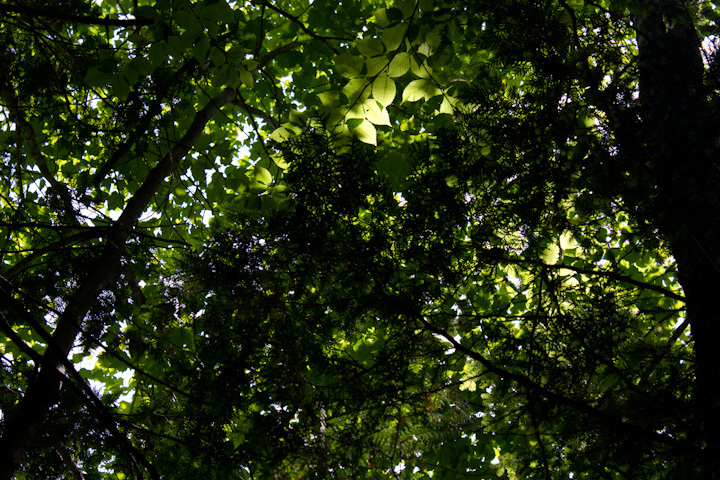 Sometimes it feels like there might be raptors in these woods. 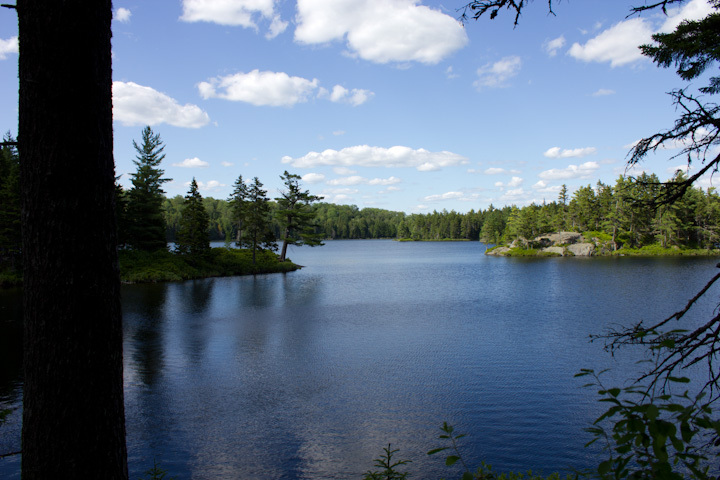 The first part of the 100 mile wilderness is mostly flat, but it meanders around several big lakes and ponds. 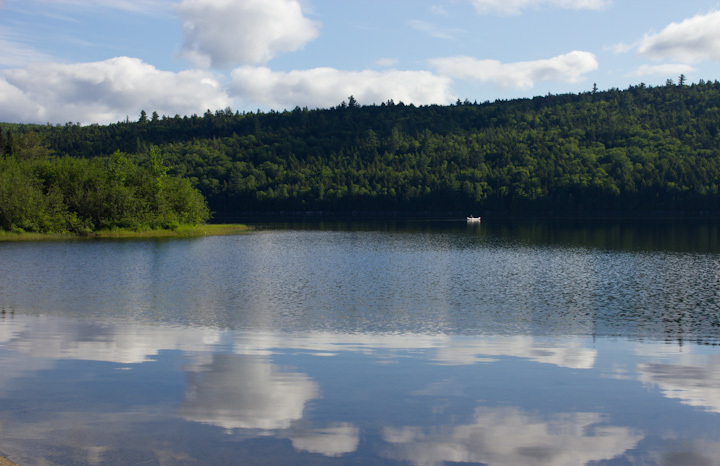 There are thousands of lakes up here, and settlers and Indians have historically traveled across the state in canoes, portaging their canoes over land to connect with the next lake. Rainbow Stream Lean-to. 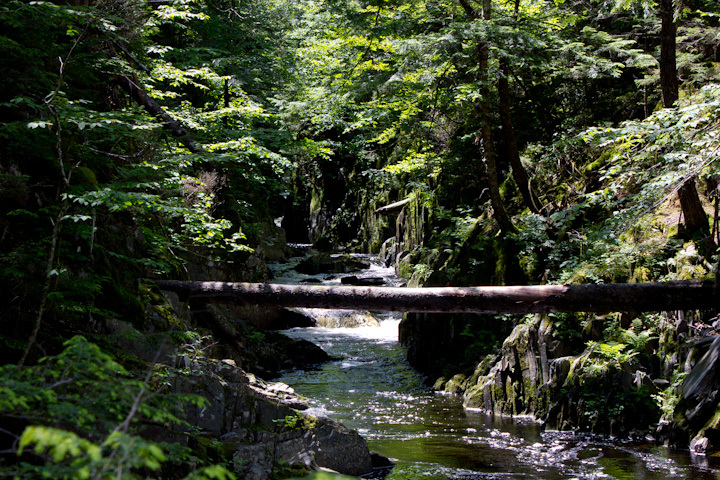 This is one of my favorite lean-tos; it has a beautiful stream and a totem pole! 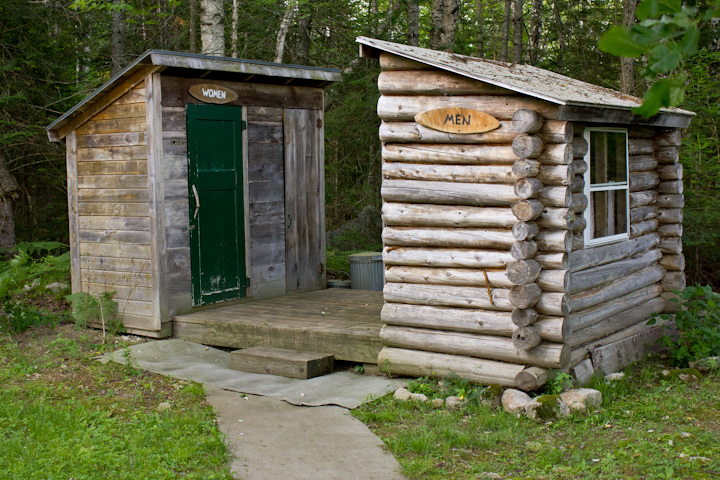 There are over 200 of these along the trail, and typically thru-hikers try to end their day at these structures as they are always built near a water source, and provide great shelter in the rain. 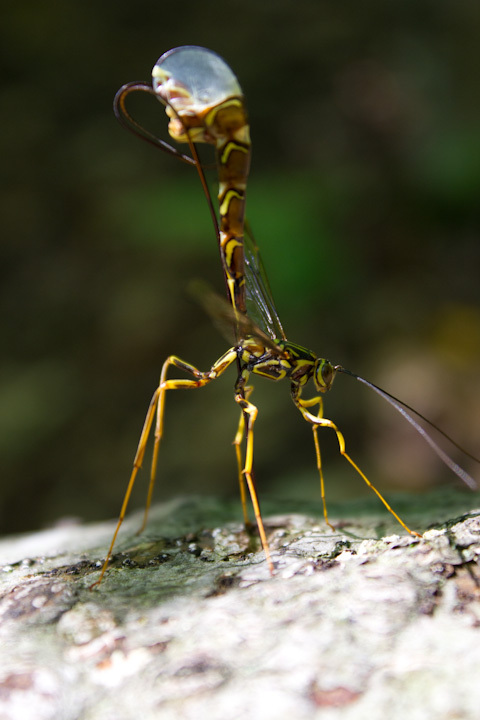 They do not however, provide any shelter from mosquitoes. I knew there was a reason I was carrying a 2lb camera! Overlook into the gorge of Pollywog Stream. It was quite the view. This was one of my favorite days. We took lots of breaks and really enjoyed the scenery. This shot was staged- Marie is actually paused in mid-step so I could adjust settings. Check out the canoe on the lake! Perfect! Lying on my back for a change. These are our friends that we made, Gillian and Zach from Florida. We met them back at Rainbow Springs Campsite and they are really good people. Zach’s knee has really been bothering him, and they would soon make the decision to get off the trail. We really missed them after and wish them well! We are waiting at the dock across the lake from White House Landing. 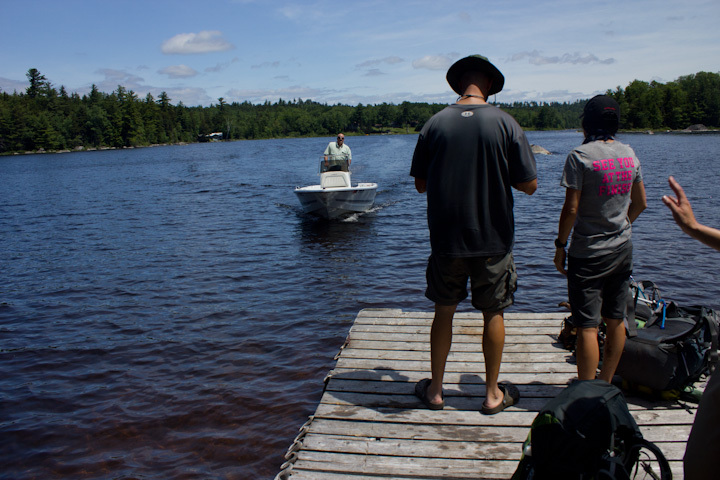 You blow the air horn (just ONE short blast) to signal them, and Bill gets in his boat to come pick you up. 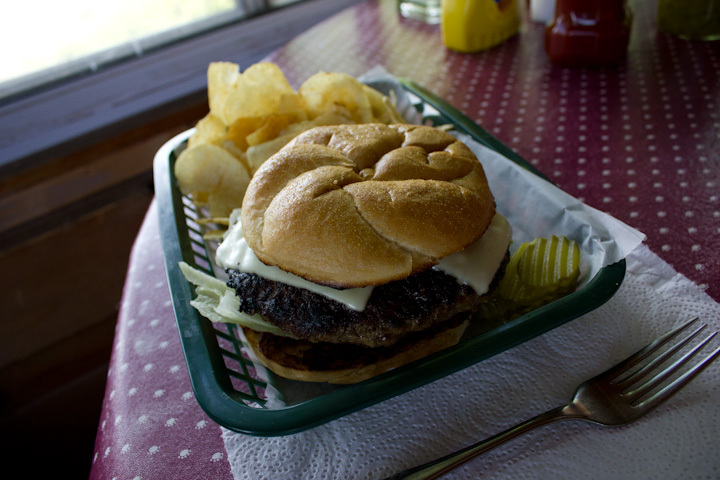 We planned to stop for the famed 1lb cheeseburger, and they only serve lunch between certain hours so we had really booked it to get the 7 miles to the dock by 1pm. We couldn’t believe how amazing this place was. It really is an oasis in the wilderness. We decided immediately that we would need to spend the night in their bunkhouse, and do laundry and eat lots and lots of food. So its not a wilderness after all, but we knew that! This was a logging camp 100 years ago, but Bill and Linda have been here for 20 and have done all of the decorating, remodeling, etc. It is beautiful. The famed 1lb burger! Can you believe it! Oh, my. That is a wild look in your eye, Bobwhite! 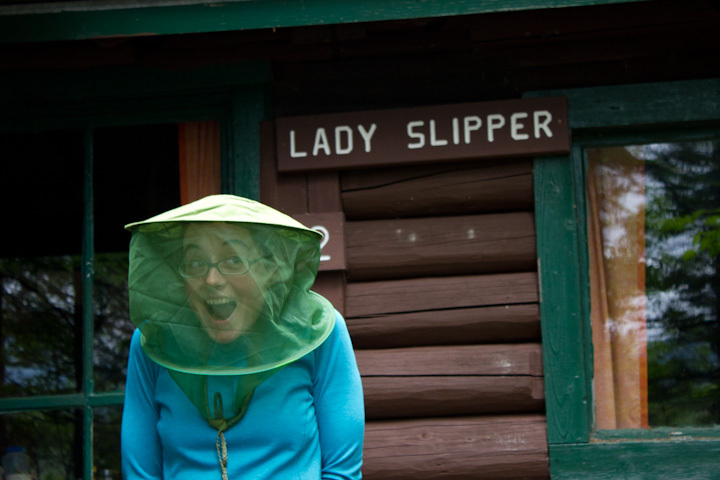 See folks, this is what happens when you feed hikers. Keep your fingers away! Pizza in the 100 mile wilderness too! This place is quite awesome. 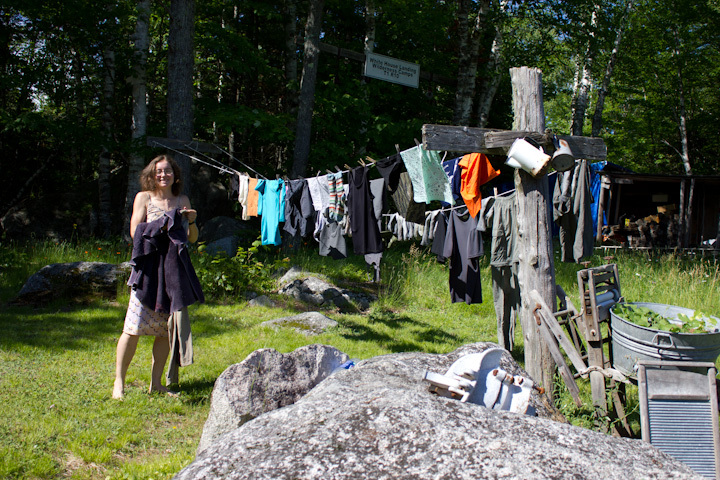 Laundry is done the old fashioned way here. It was actually really relaxing. This was simply one of the most amazingly beautiful places, and it was absolutely perfect weather. To think we would be slogging over root and rock at this moment. The grass was quite a treat too. We were very sad to see Zach and Gillian go. Good luck to you guys! I’m not sure who started this, but it was a great idea. Two halves, indeed! This stop at White House landing was really really great, and we both needed to recharge a little bit. 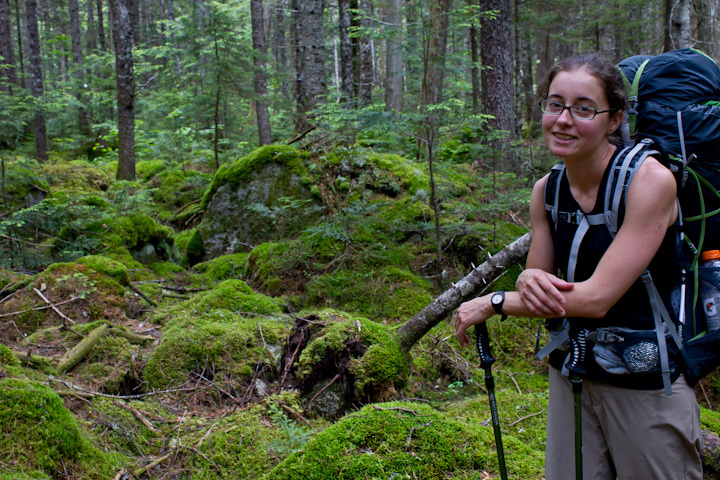 There are 70 miles of wilderness left! Many thoughts from my second town! Marie here. First time I’ve seen a computer in a couple of weeks. I’m enjoying my second town day with my dear friend Margot and several new Southbound friends!!! We decided to take a “zero” (mile) day today. So we can eat lots of town food and be less stressed about getting all of our chores done: laundry, resupply for the next 5 days, various mailing, etc. I’ve had a lot of time to mull over some bits of what I’d like to blog about. Some nights I think I’ll write some stuff down, but, more often than not, by the end of the day there I have absolutely no more energy! 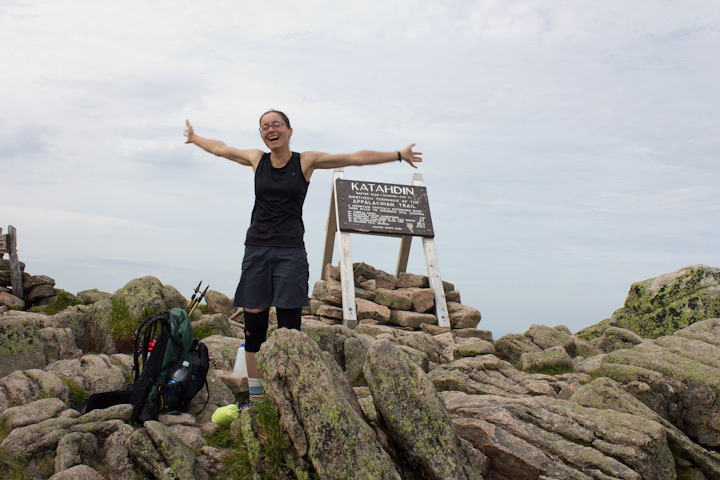 I pass many Northbound hikers, now that I’m 2 weeks in. Some of them are very friendly and give us tips on what not to miss. Some don’t want to talk at all because they are now just flying through to get to the end. Some feel over-proud of themselves and when they meet us we find them a bit condescending. Oh well, so is the “natural resentment” between Nobos and Sobos. We are just beginning with big smiles and they are just trying to finish (as fast as they can!). One day I realized the grumpy Nobos are grumpy because they do not have their best friends at their side cheering them on. They are hiking so fast all their trail friends are no where in sight. Or they just simply want to finish solo. I’m incredibly grateful to have the best friends in the world! Margot (Happy Camper!) and Powder River are helping me push through the hardest State on the trail, and more than push through: laugh all the way with no lack of snickers bars (thanks Bear!!!!). I prayed a lot about making good trail family and already I’ve seen God taking care of this, even just in the first weeks. I have some amazing trail buddies! Margot and I are so impressed by the bravery of Tag and Effect. 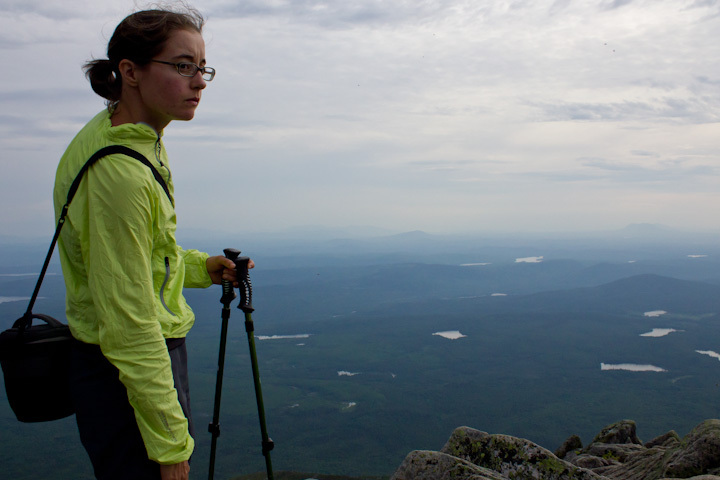 They are both 18, straight out of high school, and more than conquering the Trail. With them is Coach. A great friend to have out here, he is straight from wilderness school. I take great joy in listening to him tell me about all the different plants and how to save lives in the wilderness. The 3 of them did not know each other at the beginning, but seriously have become inseparable. If one of them needs an extra day in town to wait on mail, all of them are happy to stay too. They are amazing brothers to us out here. Also, we’ve made dear friends with “the Cousins” who we’ve affectionately named Tom Sawyer and Huckleberry Finn. They are a lot of fun, always running past us with big smiles. (Honestly, who couldn’t smile with Margot Canfield constantly giggling about something??). They will now be about a day ahead of us since they are not doing a zero today, but I hope to run into them down the trail! Hi, Jeff here. I am back from Maine and am going through the 100’s of photos I took on the trip up to Maine with Marie and her family, and through the 100-Mile Wilderness. I’m going to break these into a couple of posts, since there are so many great pictures to share. The first is our epic climb up Big K! We decided to rush our schedule ahead by 1 day to take advantage of the beautiful weather, as it was going to rain on our planned summit day. As a result we didn’t get on the trail until just before noon, and didn’t actually leave the summit until 5pm. Ordinarily this is never a good idea because of possible thunderstorms but the forecast was for zero chance of rain so we went for it. This resulted in having the summit to ourselves, having gorgeous lighting for photos and not getting back down until 11 pm! So here’s the day, in photos. 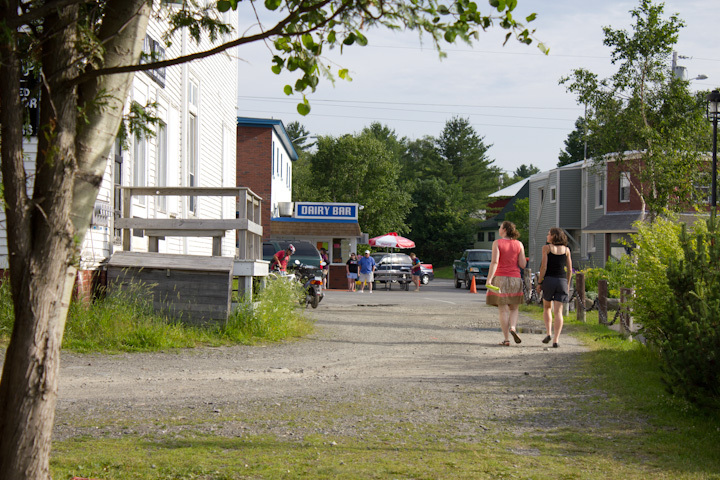 Millinocket, Maine. 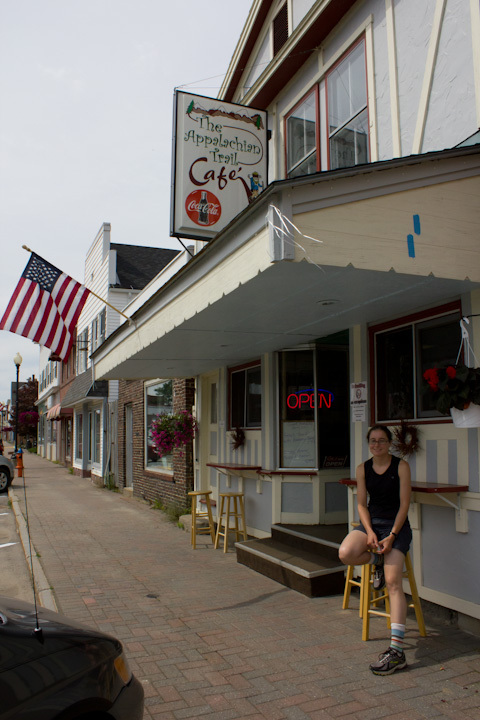 This town is the gateway to the trail, and the Appalachian Trail Cafe is an institution. It is where you can get a gigantic meal, such as the “Southbounder” which is some kind of heavenly plate of breakfast food. We only had about 10 minutes so this was really a photo op. 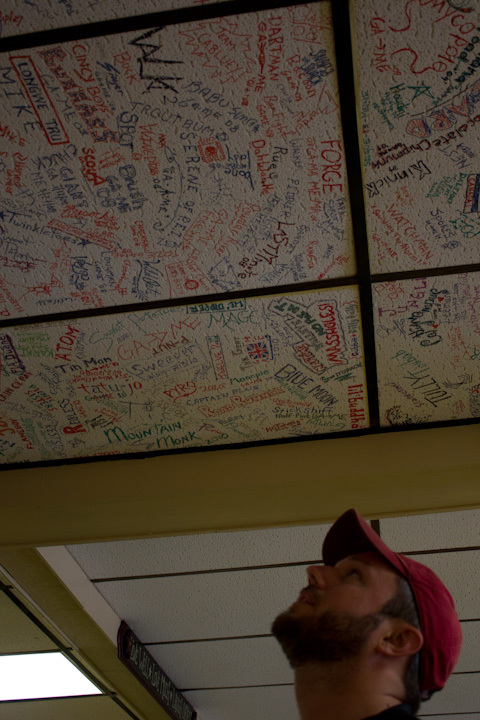 The tradition is for thru-hikers to sign a door or ceiling tile in the Appalachian Trail Cafe. 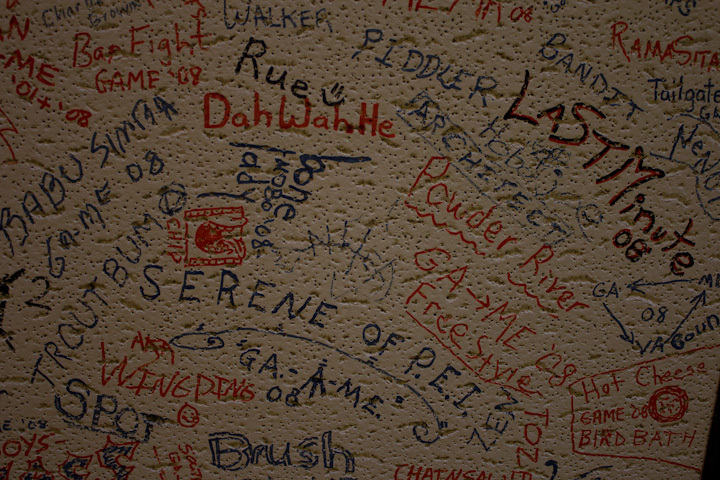 I found my name, Powder River next to that of many of my friends from 2008. Of course, when I signed this I was 40 lbs lighter and starving! We are going to climb that giant mountain! Colorful and clean! No way this can last.. Starting to come above the treeline. 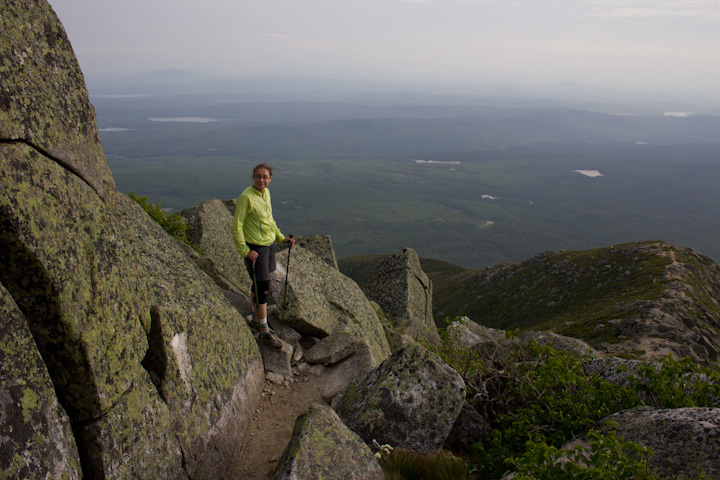 The climb was 4,000 feet in 3.8 miles, most of that elevation occurring in the last two miles. This view is south, of the trail to come! 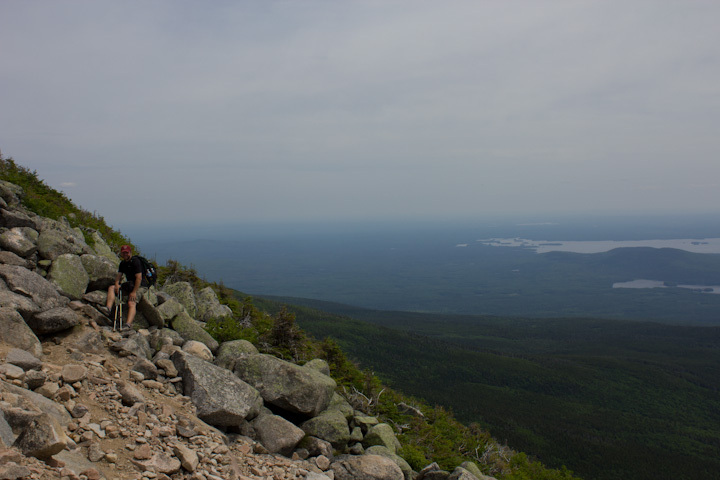 This is an attempt to give you an idea of how steep the Abol Trail is. 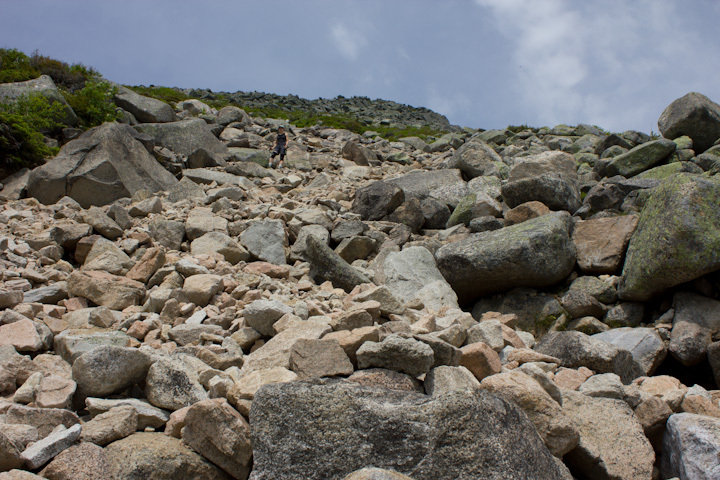 This is not the Appalachian Trail- it is a different trail that goes straight up the side of Katahdin, in the path of a rock slide. We estimated the angle to be about 45 degrees. Still, the photo doesn’t do it justice. Yeah, it was this awesome. But better. Such an epic mountain! 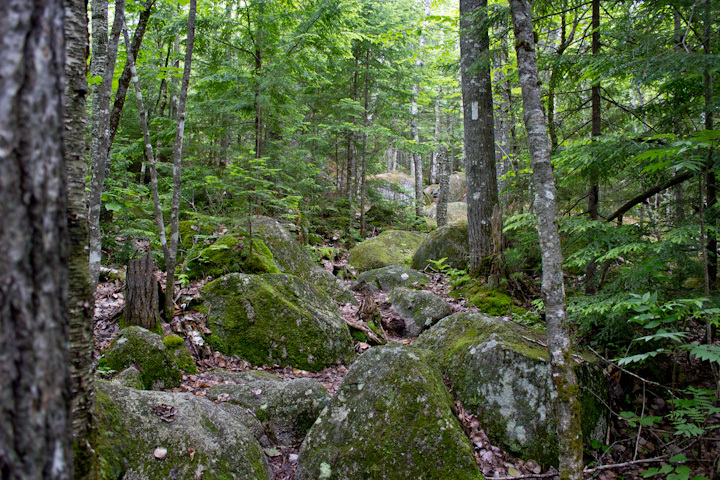 Typical “trail” on the Abol Trail. 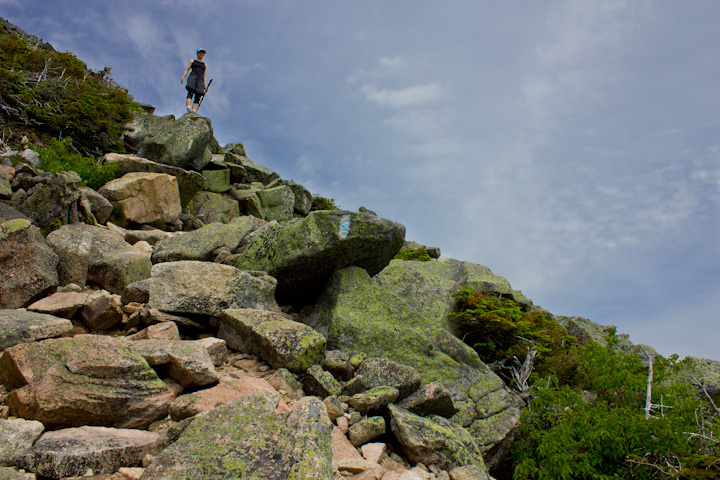 Note the blue blazes on the rocks- only the Appalachian Trail is white blazed. If you look closely you can see over a dozen people hiking the ridge to the top. Thankfully we missed them! To the west. Oh yeah! 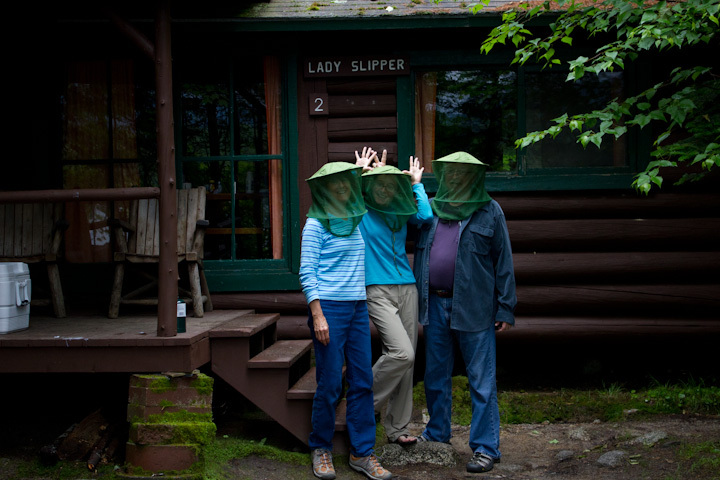 Our entire hike once above treeline was plagued by the dreaded black fly. 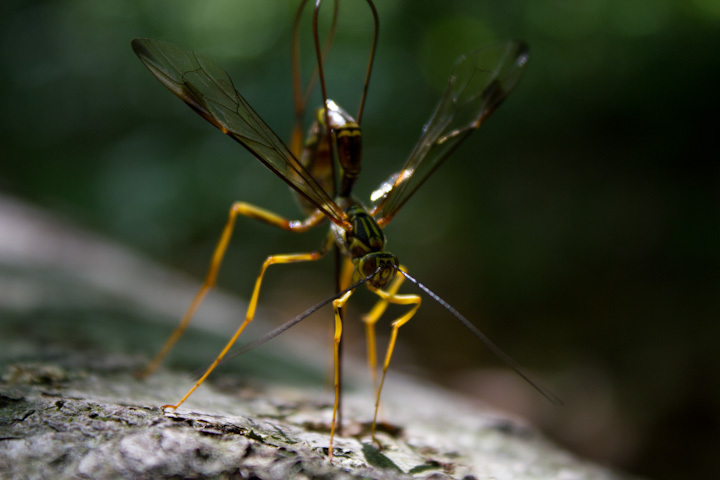 They are vicious and draw blood, and were absolutely swarming us. You can see several in this photo. 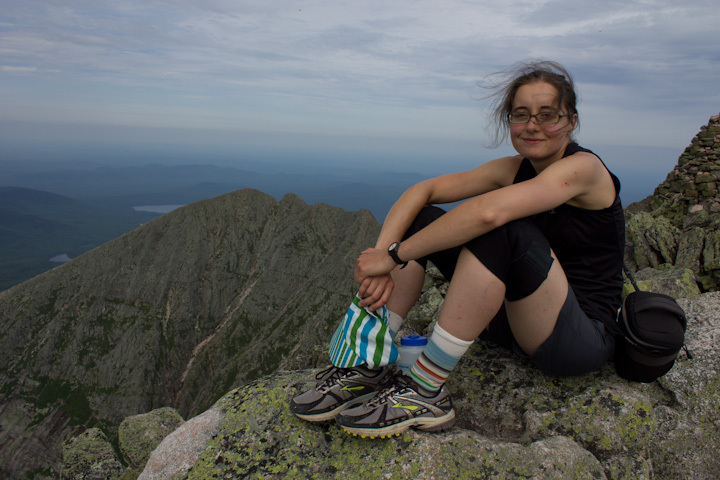 We circled around the back of the mountain so that we could say that Marie first set foot on the AT at the very first white blaze at the summit. Also it was very beautiful! 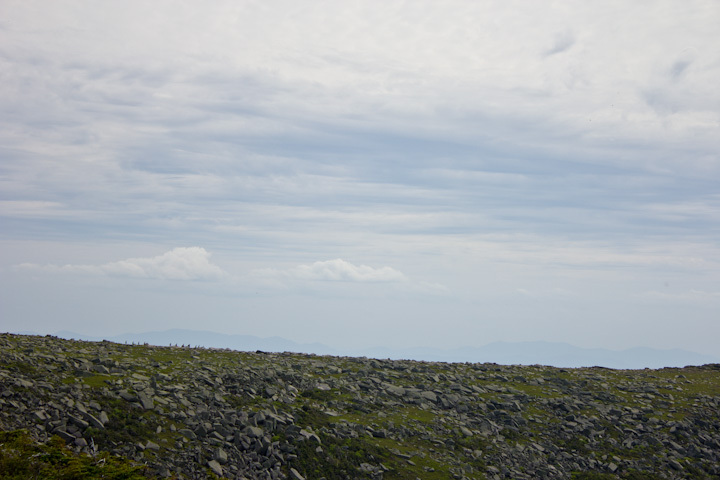 This view looks to the north, and the ridge carries the International Appalachian Trail another 1200 miles to Cape Gaspe, Canada. We had the summit to ourselves, at an amazing late afternoon hour. It was really great! For Marie, this is only the beginning. She was more interested in what was written in the fine print near the bottom of the sign than anything else. 2,179 miles from now, she will be feeling quite different! 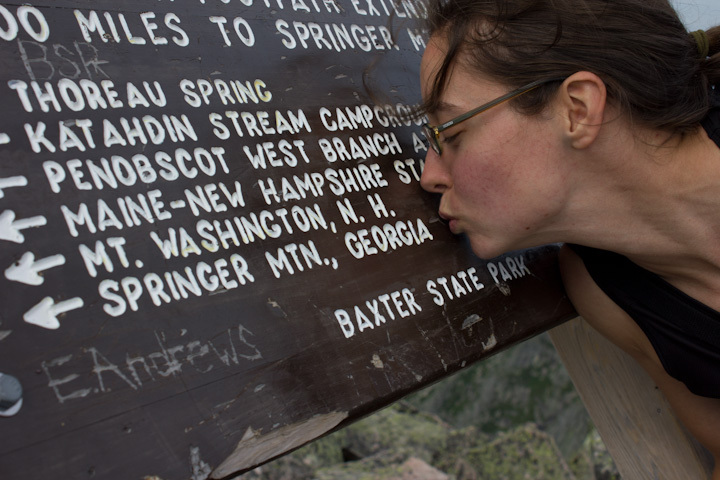 This is a subdued moment for me as well- I am overjoyed to be here to share this moment with Marie, but for my own picture with the sign it is much different than when I finished my thru-hike in 2008. Did I mention I was skinnier then? YEAH! It’s amazing we’re here! She’s on her way! I really, really couldn’t believe how awesome the lighting was. The next day was rainy and fogged in on the mountain. Whoohooo! What an unbelievable first day. This trail is going to be unforgettable, Bobwhite!